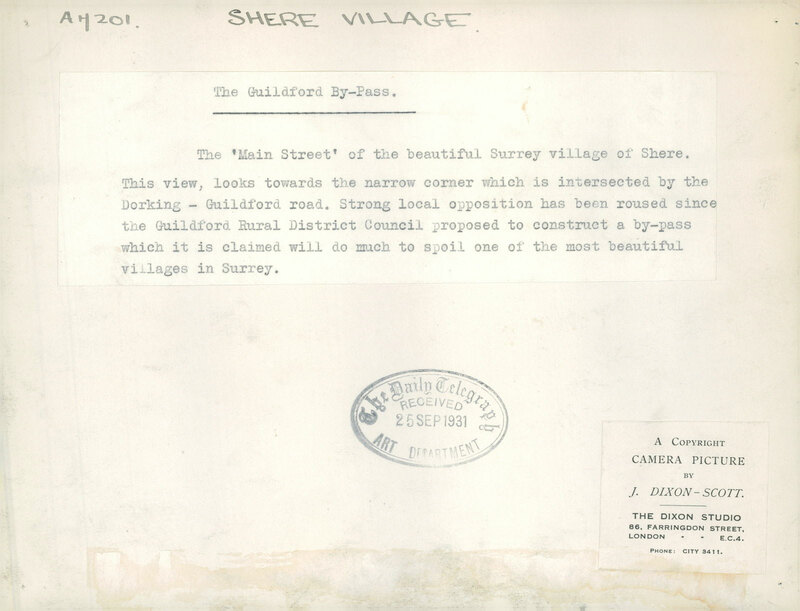 ...is dedicated to the village and villagers of Shere in Surrey. 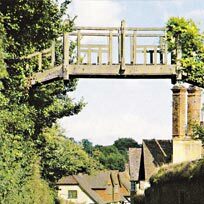 Welcome to everyone, whether you are a resident, regular visitor or planning to come and visit this beautiful village. 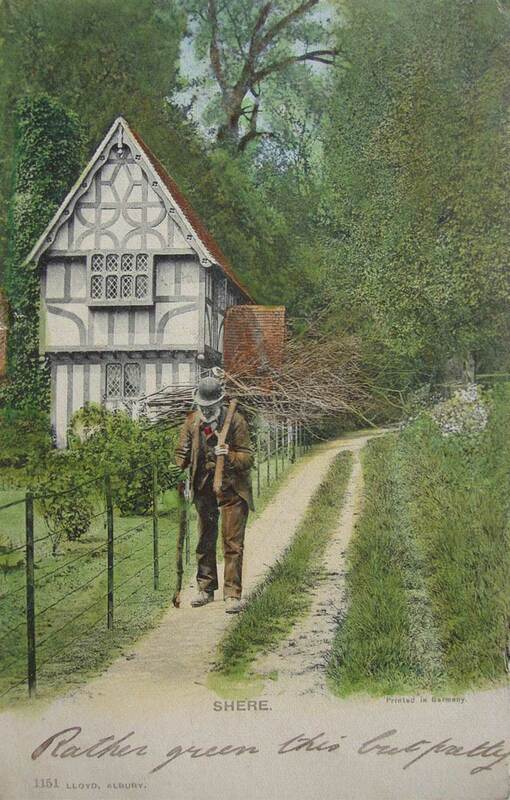 An elderly gentleman walks away from the black and white iconic 'Chantry Lane Cottage' carrying a "bundle of sticks". This rare newly discovered postcard is dated around 1930, so we can assume that the photo was taken sometime in the 1920s. Time seems to have stood still in Lower Street over the past 100 years. Very few places have, sadly. 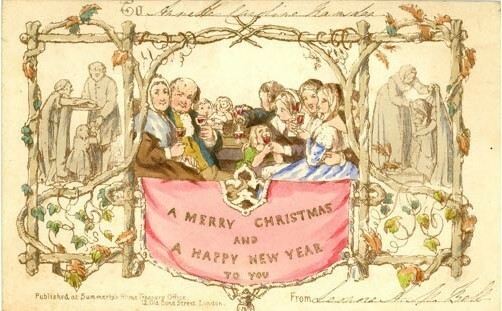 This illustrated postcard reminded me of the 1880 painting by John White, who's painted geographical location was unknown but we in Shere uncovered. 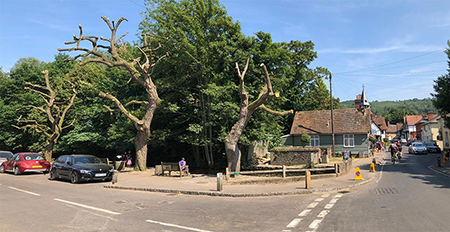 The trees and five-bar gate at the end of Church Lane triggered the comparison. The discovery of the lost location. 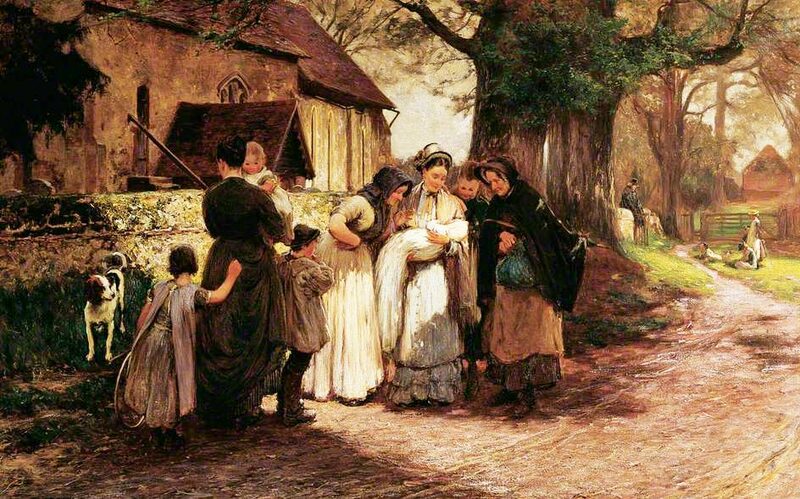 The painting named 'The Village Christening' by painter John White has had its painting location identified by myself, Tristan Greatrex. The BBC have a website dedicated to ARTS & CULTURE. In collaboration with the PCF (Public Catalogue Foundation), the painted location was unknown. 'St. 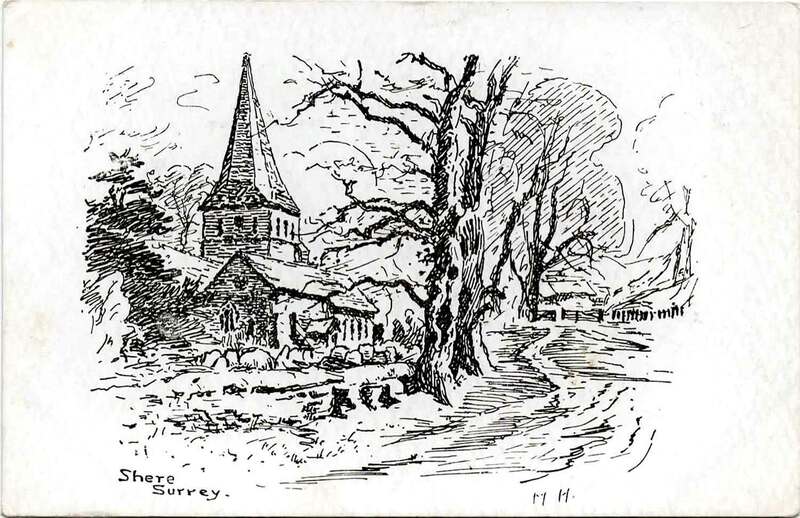 James' Church, Shere, Surrey. Distinctive steps up to door and has the same configuration of windows. Same artist (John White) also painted 'A Village Wedding, Shere Church, Surrey' a year later in 1881. (Oil on canvas, 170.9 x 117.2 cm - Collection: Royal Albert Memorial Museum in Devon). 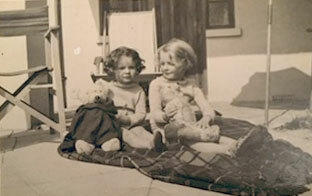 This location is due to John White having retired in 1931 and lived in Beer, Devon. He died on the 21st December 1933. 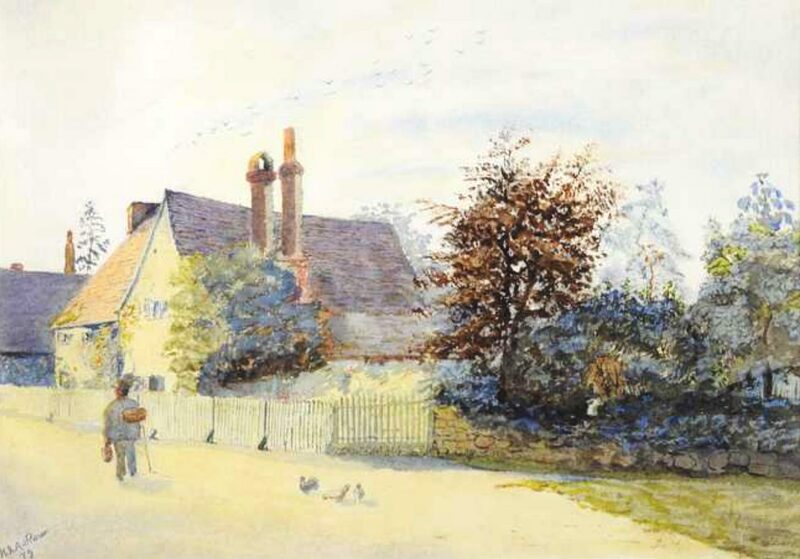 Another notable fact which helped solve the mystery, painter John White lived at Shere from 1877 to 1882. 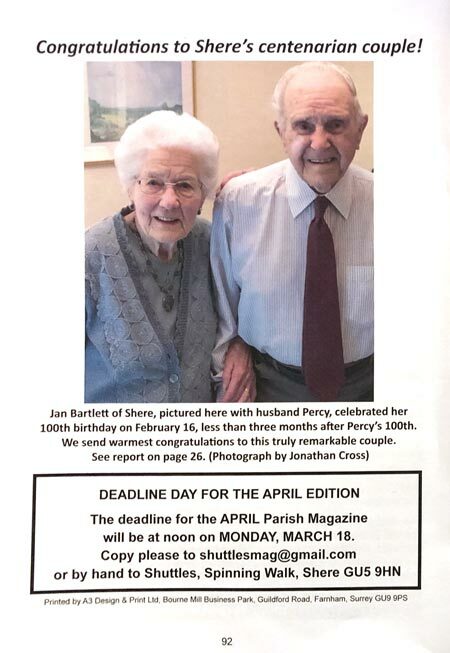 Congratulations to Shere's centenarian couple! 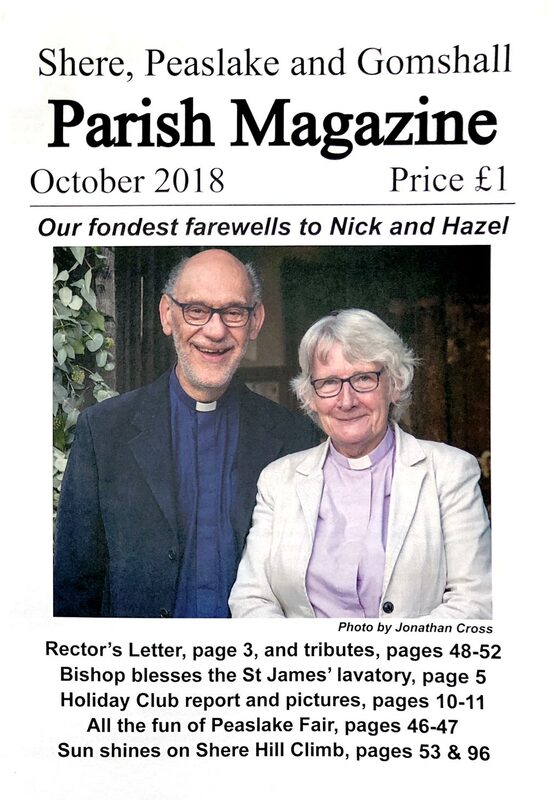 As mentioned on the last post regarding John Ellenger who, sadly passed away at the end of December, a full page obituary appears on page 36. We send our love and thoughts to Liz and all John's family. 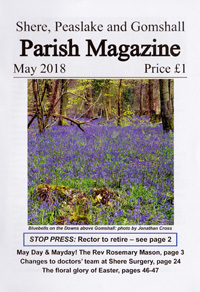 Deadline for news/info regarding the April Edition of the Parish Magazine will be noon on Monday, March 18th. I would like to mention the sad news that a dear friend to this village website, John Ellenger, passed away at the end of December. 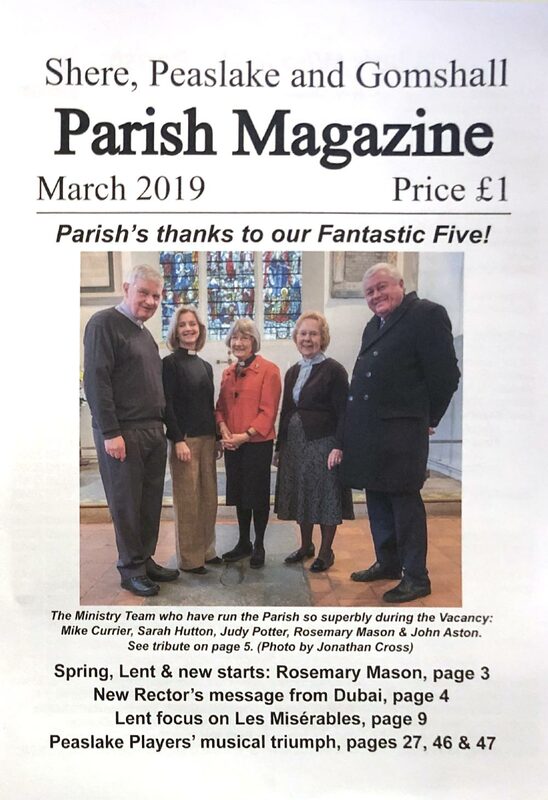 Page 28 of the Parish Magazine announces the sad news and the plan is that the March issue of the PM will feature a full obituary. We send our love and thoughts to Liz and all John's family. This final photo in a series of four, taken in The Square. This third photo in a series of four, taken at the junction of Middle Street/Upper Street and looking towards Gomshall Lane. 'Bank Terrace' can be seen on the right and Vine Cottages on the left. The photo was also taken in support of the 'much talked about' Shere by-pass (see December 16th post below). 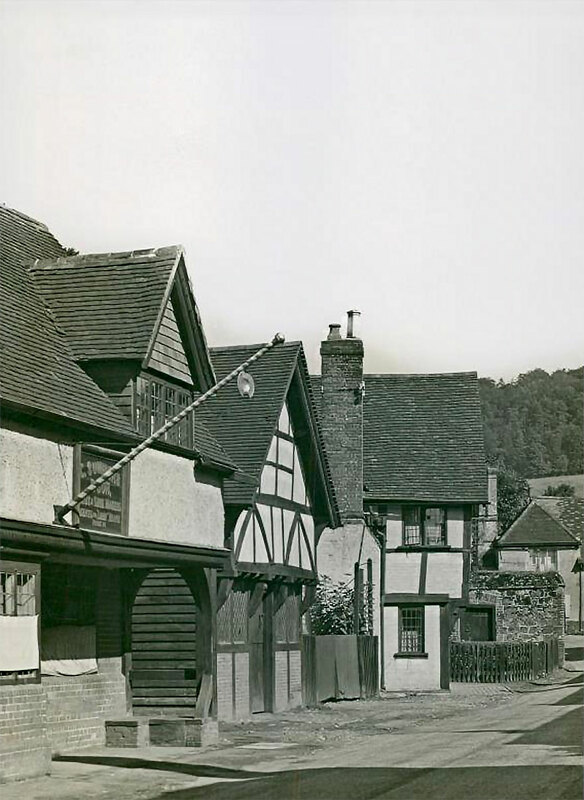 Note: The corner shop, currently named 'Cuckoo Corner', still retains the render on the top half of the building hiding the beautiful wood structure that we now see today. 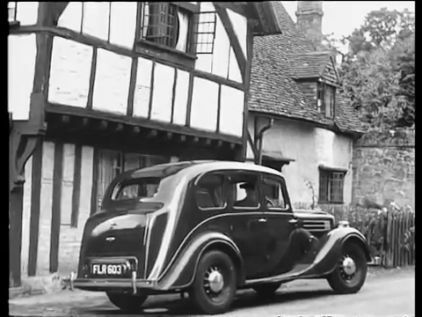 Does anyone know the make and model of the car? 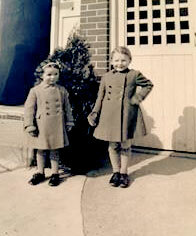 This second of four original photos recently uncovered (first of these can be seen on the December 16th entry below). The third photo will be posted next week. 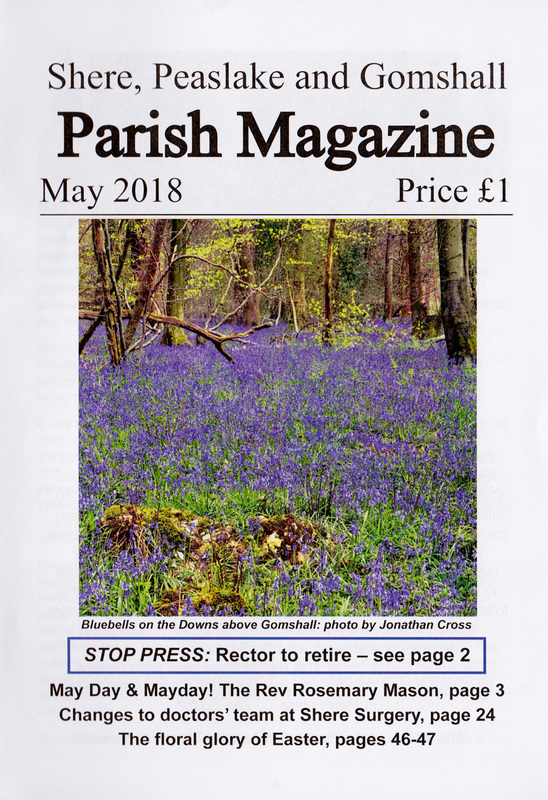 Pat Nelson is standing down as Parish Magazine Distribution Manager for Shere and Gomshall after more than 30 years in the role. You can read about this in detail on page 4 of the magazine. Thank you Pat from all of us in the Parish. 2. 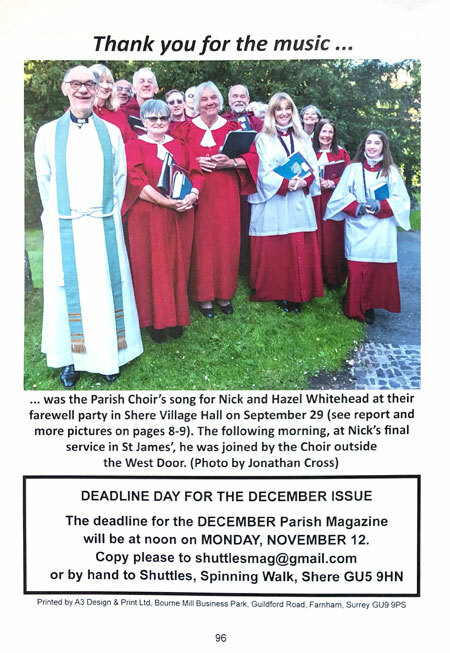 Parish Mag to go online - after a pause! This exciting development is in its finalising stage. 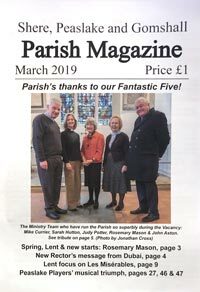 Its great to see just how much our Parish Magazine is keeping abreast with the times and there is no need to worry as the printed magazine will always be three months ahead of the online version. The Editor, Tim Austin, explains all in the magazine. 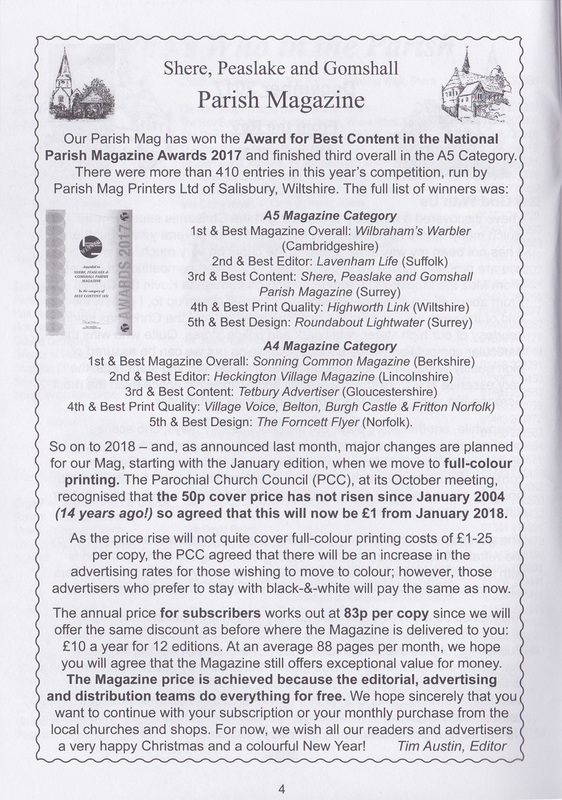 This time last year, he very first issue of the January 2018 Parish Magazine was produced and printed in full-colour, hot on the heels of collecting the 2017 National Parish Magazine Awards for the 'Best content' catagory. 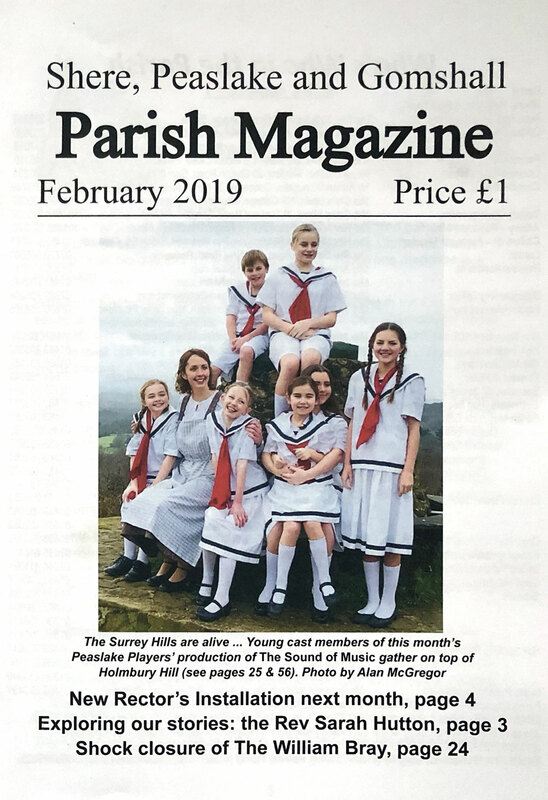 I feel so lucky to have such an amazing monthly magazine that keeps us all connected in so many different ways - thank you to all the editorial team for producing such a wonderful link to our community. Three years earlier, in 1840, Cole was credited with being instrumental in revamping the postal system and creating the first self-adhesive postage stamp: the Penny Black. Sir Henry Cole was also close friends with Queen Victoria and Prince Albert. Cole accepted the commission from the Royals organize the Great Exhibition of 1851. This merging of art, industry and manufacturing was so successful that there followed similar exhibitions in London and Paris, and it was instrumental in reforming the patent laws a year later. Sir Henry Cole also founded the VICTORIA & ALBERT museum in London. 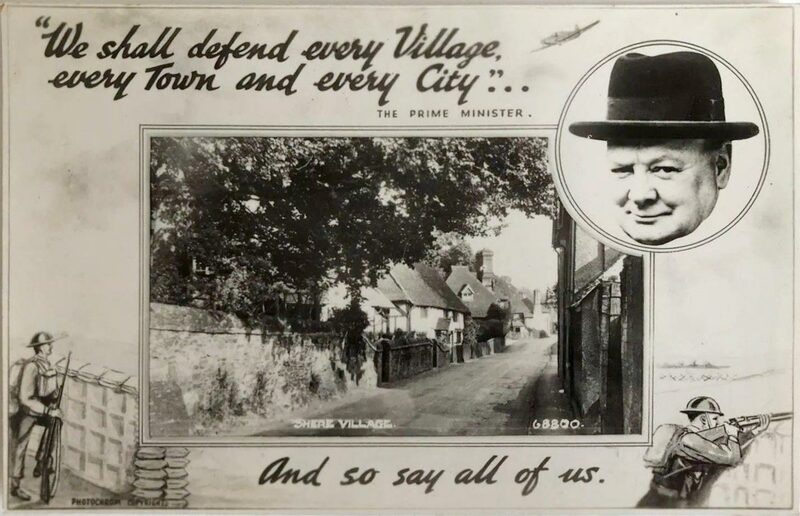 We should be very proud of our village and the connection to these amazing events/milestones in History. The photo was taken in support of the 'much talked about' Shere by-pass. 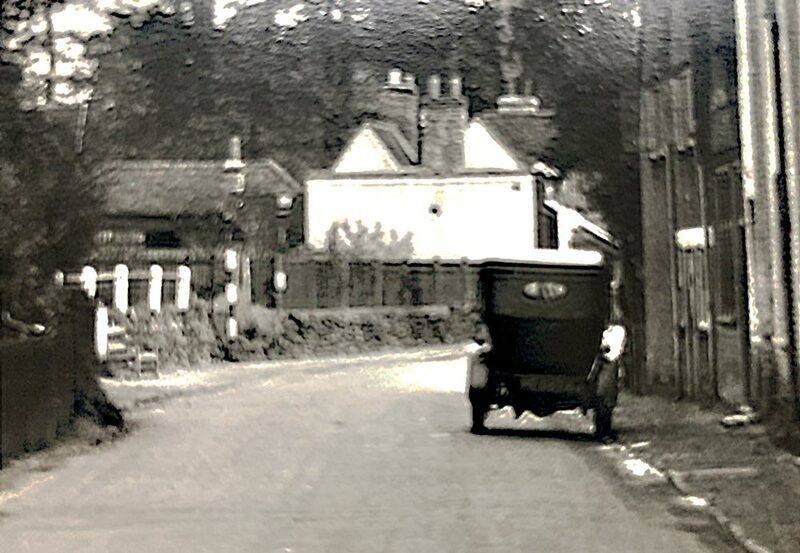 Its interesting to note that the traffic and the motor car was starting to become a concern so early in the 1930s. 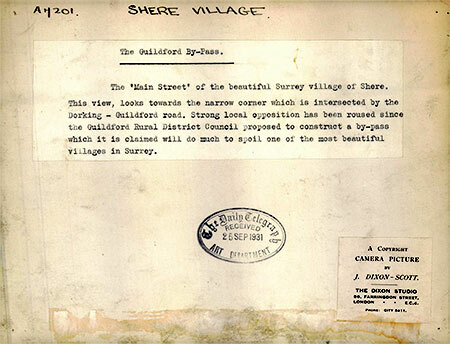 But it was to take another 29 years of discussion and planning before the Shere by-pass was built. 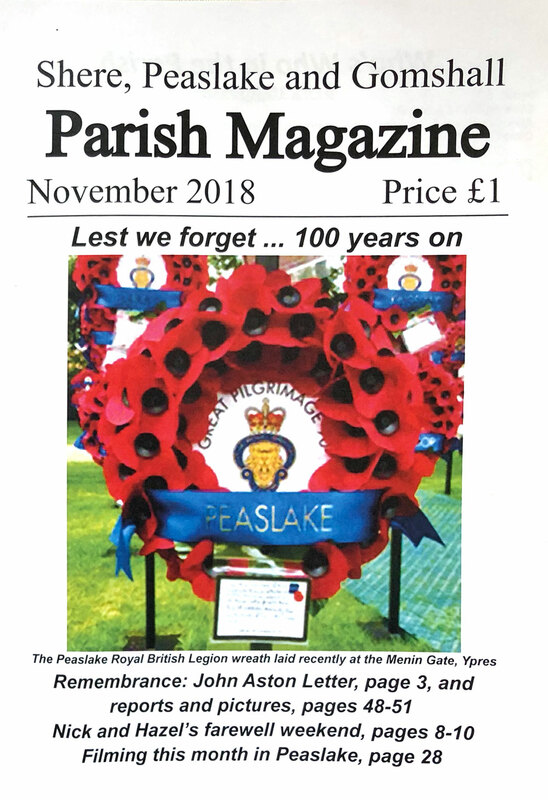 The final Parish magazine of 2018 and as ever an amazing year for the Editor, Tim Austin and his editorial team. 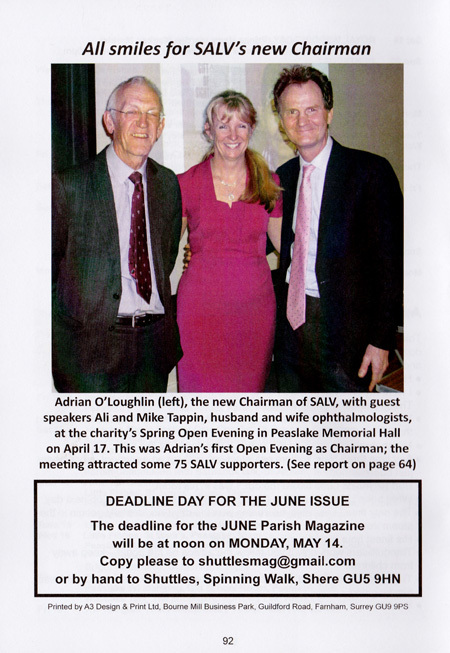 On page 8, Tim talks about the years milestones and the work that ittakes to deliver such an outstanding publication. To echo the editors sincere thanks, the village website would like to thank The Editor (Tim Austin) for his amazing work ethic and his amazing team: advertising manager, editorial helpers, deputy editors, photographers, street deliverers, printer, all contributors and the Ministry Team for suporting the team to help us 'keep in touch' with our community. 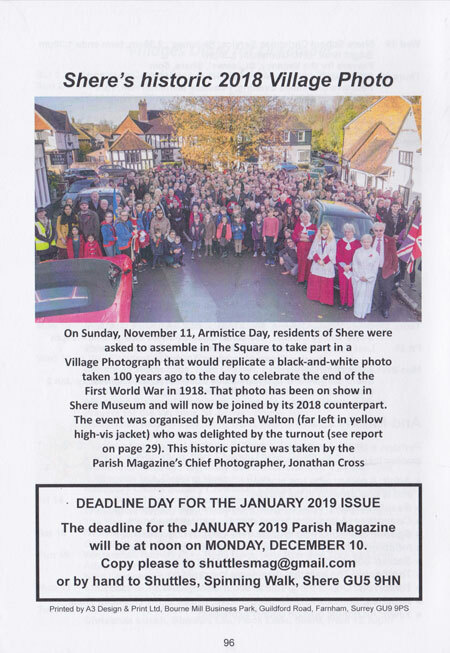 Finally I was very excited about the back page of the Parish Magazine - 'Shere's historic 2018 Village Photo' which was taken on Sunday November 11th, Armistice Day. Sadly this passed me by but was so pleased that such an idea - thank you Marsha Walton - was acted upon. 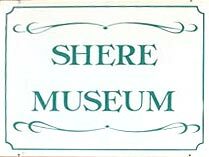 Please call into the Shere Museum to have your name included in the list of people shown in the photo - there is a list waiting for your name to be added. I have received an email from ex-Hurtwood School pupil, Anna Gray. 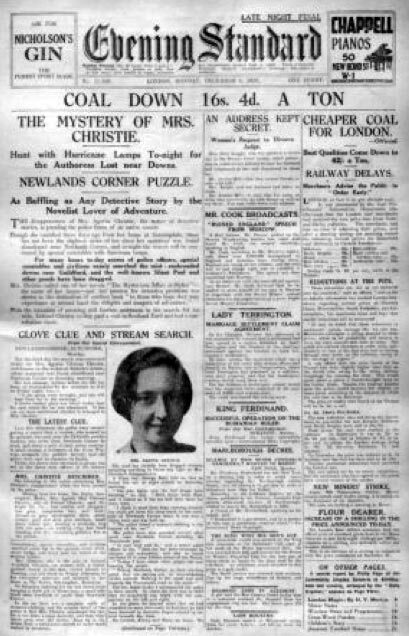 Its rare that we get an e-mail regarding life and memories from so long ago, 80 years in fact, so this article warrants special attention. "The School took a small number of children between the ages of 3 and 14, as well as caring, during the holidays, for children whose parents were abroad. 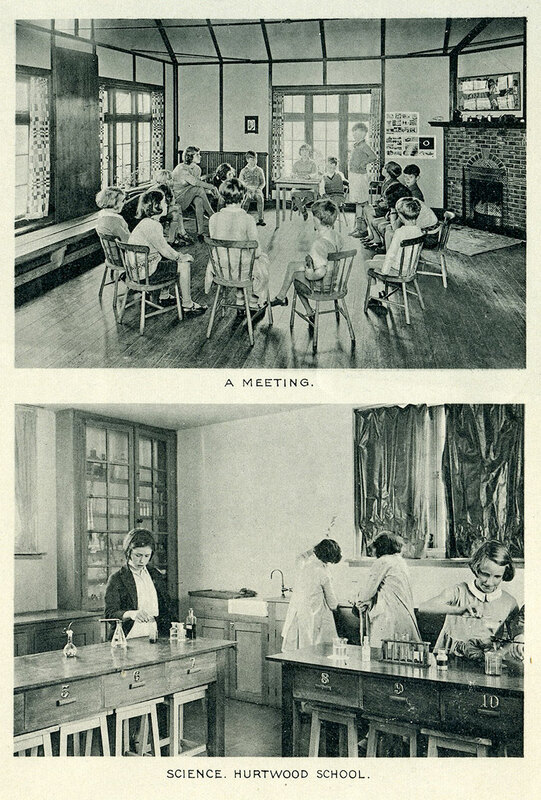 It was a most advanced school for the time, with the building having been constructed in 1929, along very modernistic lines, quite out of keeping with the rest of the village. 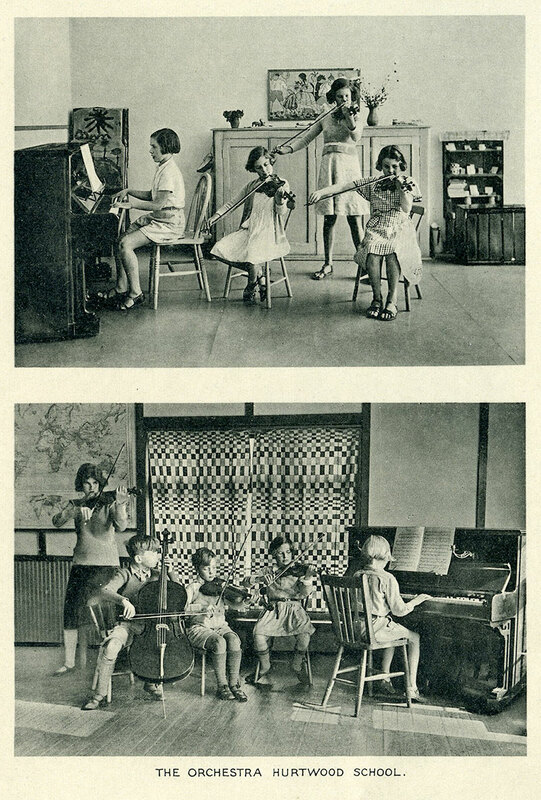 We were there for a year, firstly as weekly boarders but latterly stayed full time, leaving only when war broke out, and Father was posted to Dartmouth College (as he was called back into the Navy) and Mother found another school for us in Penzance, from whence her family came. That school couldn’t have been more different, and if you have ever read 'The Shell Seekers' you can imagine what it was like, as 'Rosamunde Pilcher' was there at much the same time (but is nearly eight years older than me). I once wrote to her and told her what I thought of the place, but she replied very tactfully. I not only recognised it, but knew two girls on whom she must have based some of her writing. 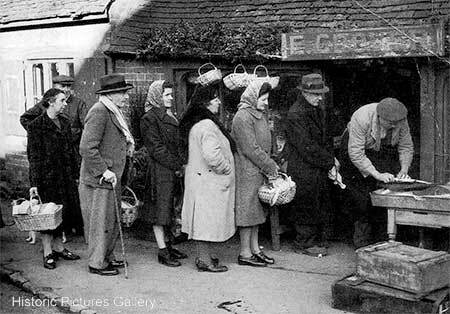 We never returned to the South East, although on one occasion just after the war Father took us back to visit Miss Jewson, our old Head Mistress who was still at Hurtwood School. 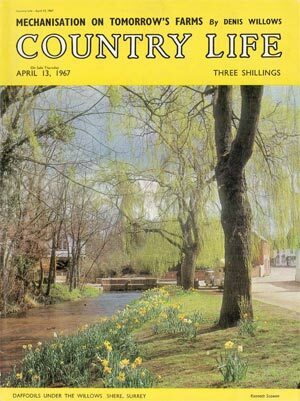 In 1958 I went to live in Southern Rhodesia - now Zimbabwe - and only returned to this country in 1992, settling in Suffolk where I still live. 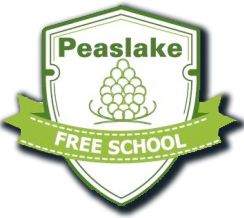 However some years ago Janice and I were able to meet and make a trip over to Peaslake to try and find our old school, which we did. It was a Saturday afternoon, and as we drove up to the school. We recognised it at once. We knocked on the front door which was open, but received no response, and it soon became evident that the whole place was deserted. We therefore wandered round to the back and gazed in disbelief at what we remembered as an almost Olympic sized swimming pool, into which we had been dropped on the end of a rope and expected to swim. Unluckily I had met a frog, which put me off swimming for many years!. We were amazed on this occasion to see that the pool was in fact very small indeed. I seem to recall that we eventually found someone in the village who told us that there was a fete on somewhere and everyone must have gone to that. I would just love to know what happened to it, and should be most grateful if you have any information you could let me have. 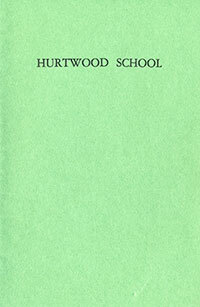 I have the school prospectus, which I could photocopy and forward should you be interested"
Anna has since sent me the scans of the Hurtwood School prospectus from 1938, hard to believe its 80 years ago.  I have created a PDF document so that you can read it in full. click on the cover to the left. 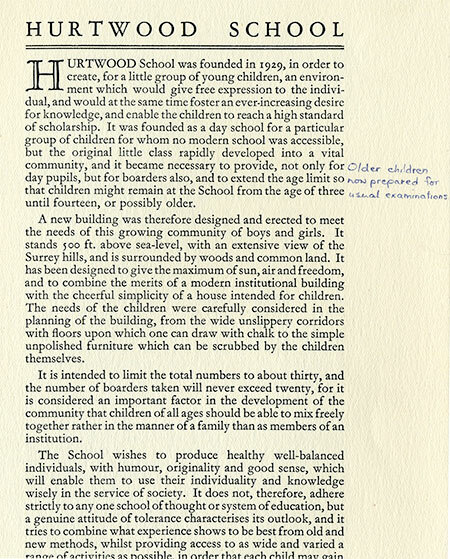 Anna also attached scans of the Hurtwood School prospectus from this time, 1938. 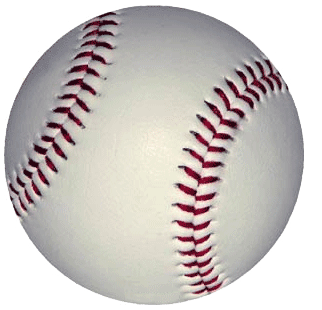 I have created a PDF document so that you can read it in full. Click this link to read the school prospectus. Can anyone help Anna regarding the information she seeks? 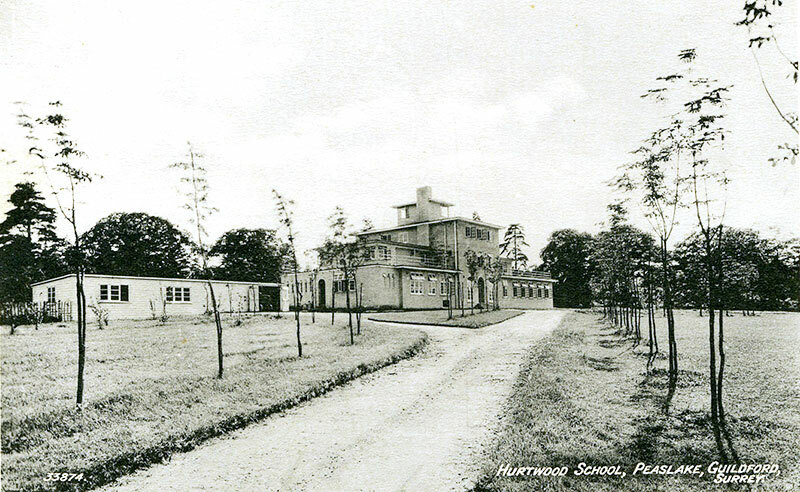 ...I have found out that Hurtwood House Boarding School now uses the old Hurtwood School building as one of its boarding houses. 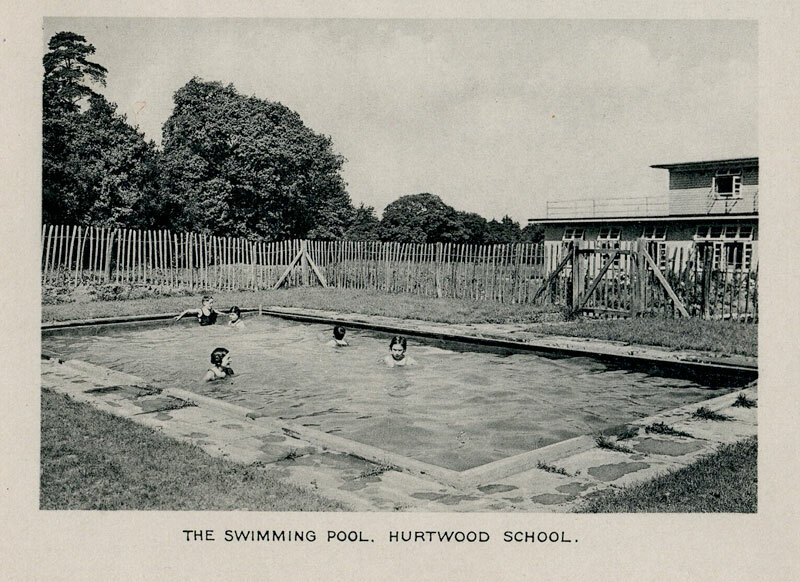 Please e-mail me if you have any stories or know of anyone who may have attended the Hurtwood School. NEWLY UNCOVERED PHOTO: Taken sometime in the 1950s at the top of the Middle Street (Gomshall Lane/Upper Street) Junction. It's lovely to see the cobbled pavement outside the shops. Above is the bronze plaque bearing the names of thirty three brave men from our Parish (Shere, Gomshall and Peaslake). 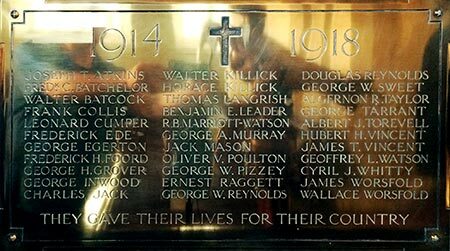 The plaque can be viewed on the inner northern wall of St. James' church in Shere. 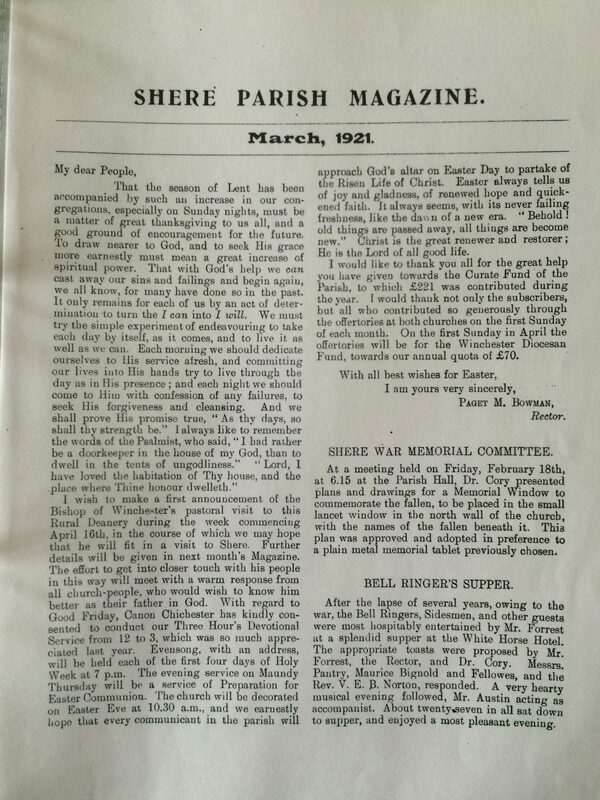 March 1921, reported that at a SHERE MEMORIAL COMMITTEE meeting that Dr. Cory presented plans and drawings for a memorial window to commemorate the fallen. 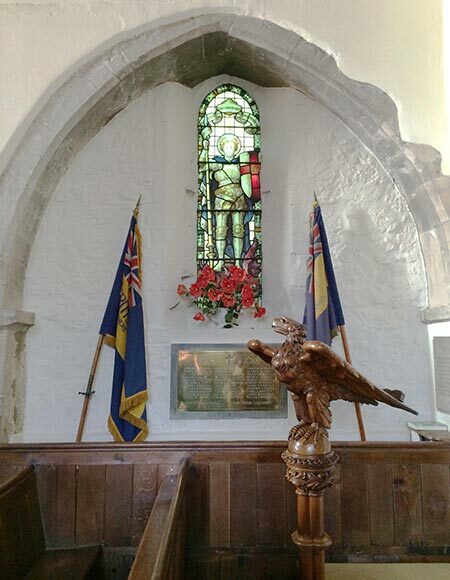 Left Photo: The stained Glass Window depicting St. George along with the dedicatory inscription within the glass at base reads :"To the glory of God and to the honour of the men of this parish who fell in the Great War." 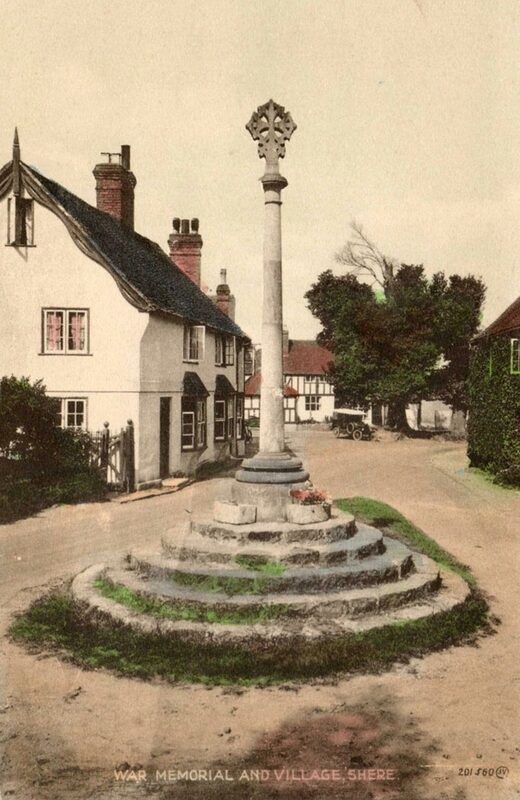 In February 1921 the Shere War Memorial Cross was unveiled consisting of a 'nameless' stone cross. Location: The Square, Shere, Guildford, GU5 9HG. Design: Floriated Maltese cross on cylindrical shaft, circular plinth and five stepped base. 1892 - Summers’ Barber’s Shop (now "The Dabbling Duck" tea rooms) was designed for Charles Summers, Barber & Shoemaker. 1892 - Lutyens’s cottages (Shere cottages) in Upper Street. 1894 - East Lodge with its prominent green gable. 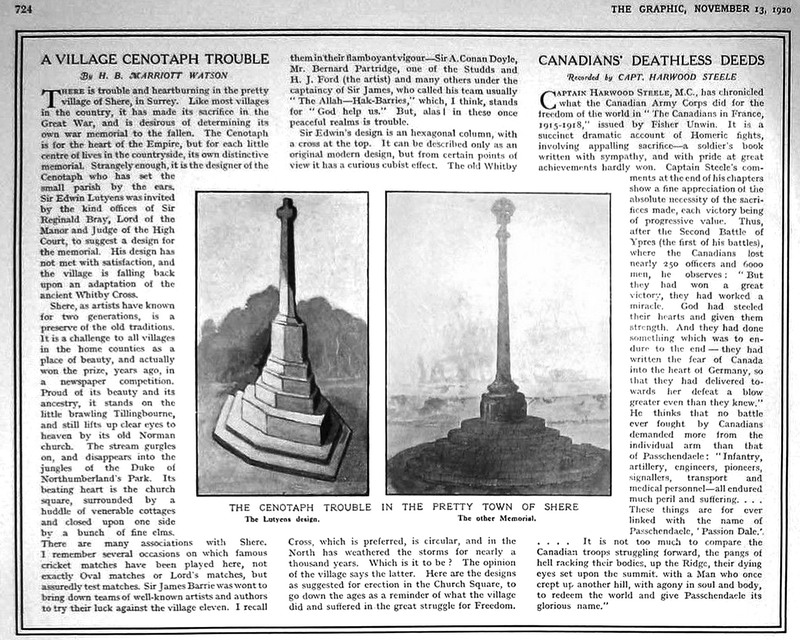 Two months later (Feb 1921) after the article was published, the War Memorial was unveiled in Shere and designed by Dr Isaac Rising Cory. 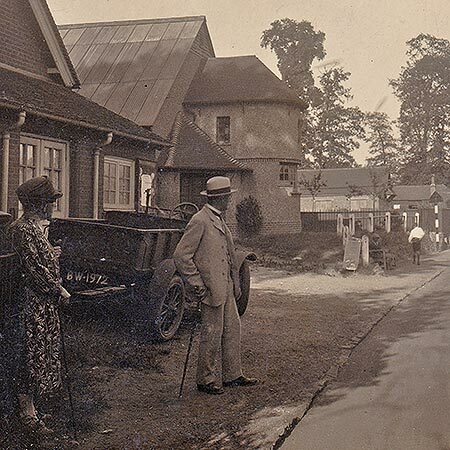 When the men of Shere returned from serving in the First World War the Parish wanted to honour them, by building and completing the present Village Hall. This was completed in 1922 and again designed by Dr Isaac Rising Cory. The then Original Parish Hall (the current location of the Shere Museum), was built to commemorate Queen Victoria's Diamond Jubilee in 1898 then became available for The Shere Working Men's Club. 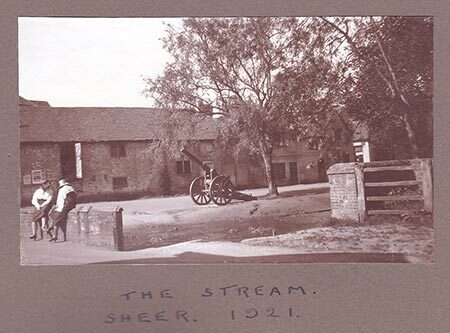 The Shere Working Men's Club closed in 1997 and the hall lay empty until 2006 when a team of volunteers started work on converting the building to house the village museum. 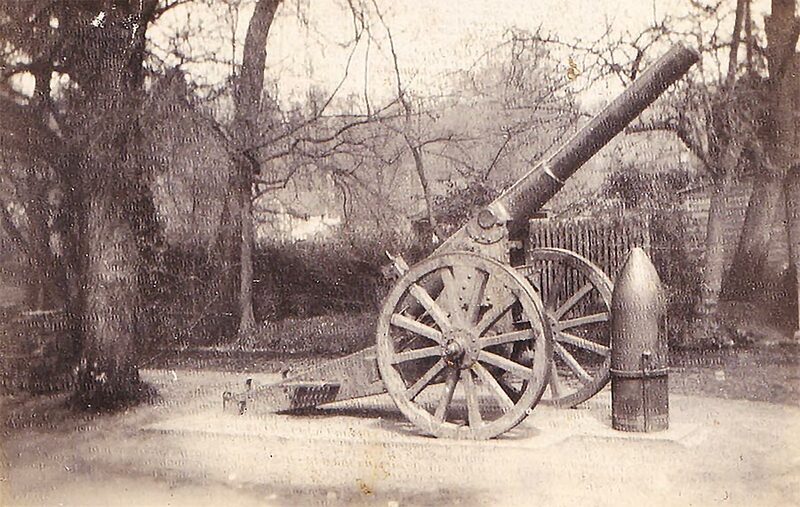 You will see on various old postcard's a Gun sitting next to the Tillingbourne river (opposite the duck house) - This gun was to commerate the finish of World War 1 and was in place between the two World wars (1918 to 1940). In 1940 the gun was taken away and used as Scrap Iron for the Second World war effort. 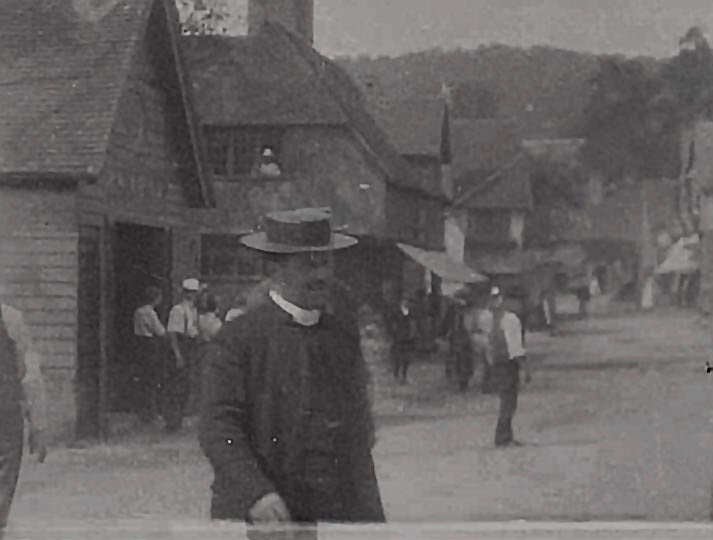 Dr Isaac Rising Cory (1860-1945) was an extremley important figure in the village of Shere. He lived at Pilgrims Garth. 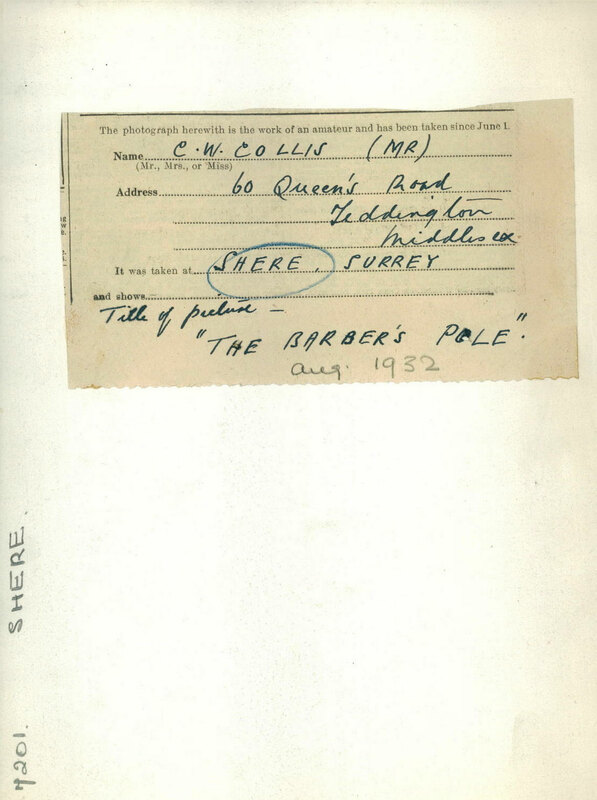 • member of the Shere and Albury Fire Brigade. 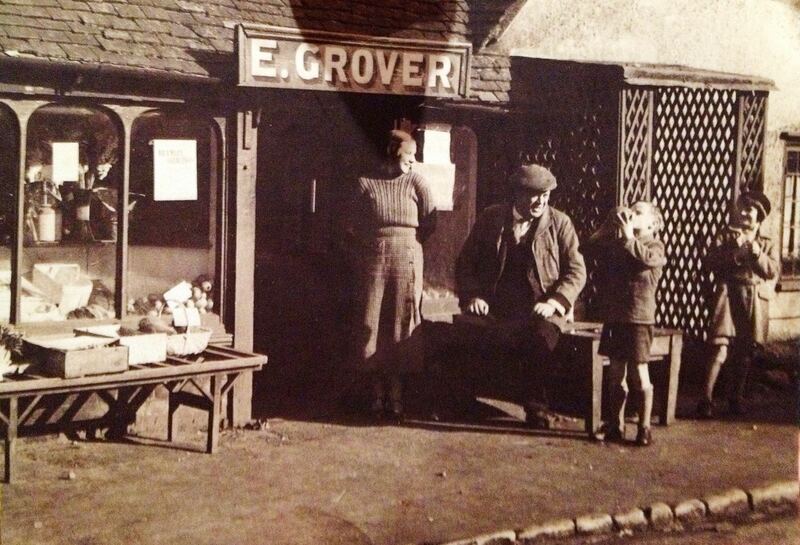 After last weeks post showing the queue during the war, here is a relaxed photo of Mr. Grover during this period (although on second thoughts, judging by the sign, it could be during the thirtees or sometime after the war as the shop sign looks new). It would be fascinating to find out who else is the photo. Is it family or villagers just visiting? Lord Pethick-Lawrence, Secretary of State for India and Burma. Lord Pethick-Lawrence liked to do the weekend shopping which he regarded as a happy relaxation from his work in politics. 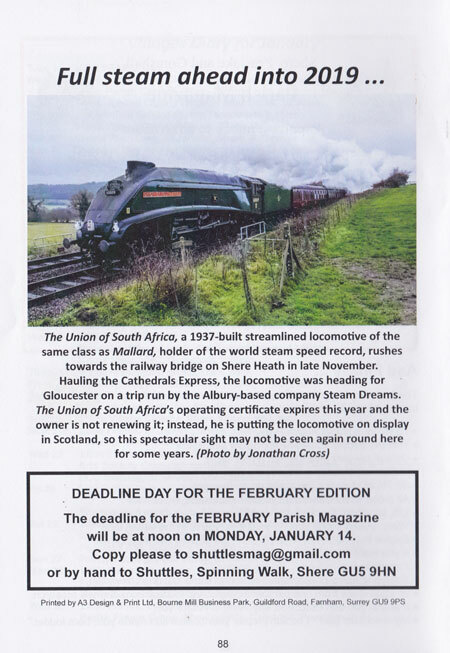 Thanks to Peter at Historic Pictures Gallery for the above information. British politician who was a leader of the woman suffrage movement in Great Britain during the first two decades of the 20th century; he later served (1945–47) as secretary of state for India and Burma (now Myanmar). 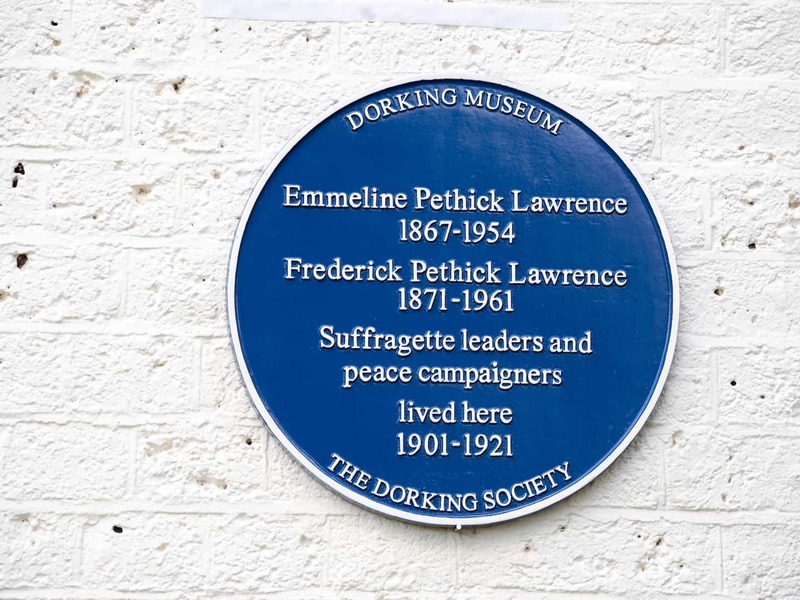 In 1901 Lawrence married Emmeline Pethick, a fellow social worker in the East End of London, and added her family name to his own. Together they assailed their nation’s prosecution of the South African War (1899–1902) and then became leaders in the agitation for woman suffrage. Pethick-Lawrence spent nearly all his considerable inheritance paying suffragists’ fines; and in 1912, after a demonstration in London, he served a few months in jail. A Socialist and Labour Party member, he defeated Winston Churchill, at that time a Liberal, in the 1923 election to the House of Commons from West Leicester. In Ramsay MacDonald’s second Labour ministry (1929–31) he was financial secretary to the Treasury. Secretary of state for India and Burma (August 1945–April 1947) in the Labour government of Clement Richard (afterward 1st Earl) Attlee. He was created a baron in 1945. 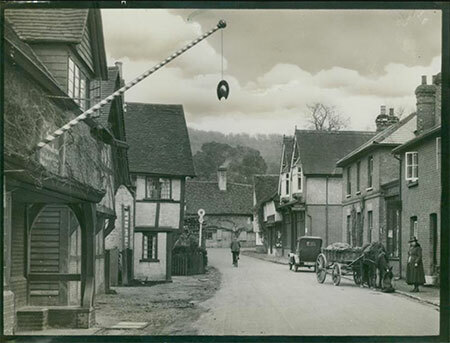 A Quiet Street View - The village without a motor car in sight. 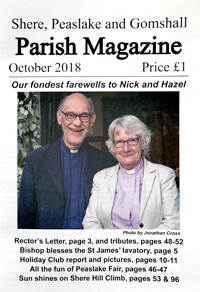 Farewell tributes to Nick and Hazel: the road from restoration to retirement - Nick and Hazel Whitehead will leave The Rectory in Shere this month after 8.5 years of immensly successful ministry in our Parish... ...May we wish them God speed! 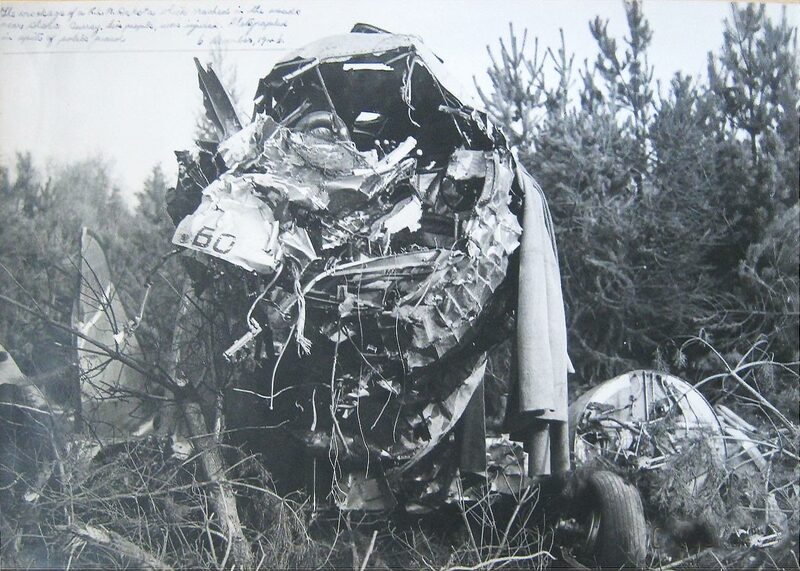 Following up from the feature regarding the KLM airline accident, the above photo has been purchased. Taken by the Award winning press photographer Geoffrey White. He worked from the 1940s through to the 1980s for various publications such as The Daily Graphic, Daily Sketch and The Daily Mail. A highly respected photographer who was given passes to attend major events. 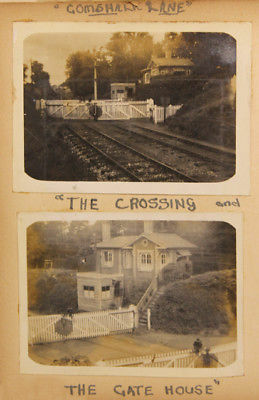 The final two uncovered photographs belonging to Miss E Frost of Crossing Gate Lodge, Gomshall, dated 1934. 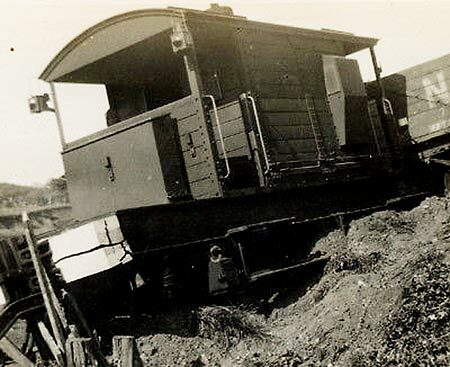 You can clearly see a man standing next to the loco. This may be a clue to the story posted bck in 2009, regarding a train crash thought to be during World War II - Full story below - Was this just a confusion with dates or totally unrelated? 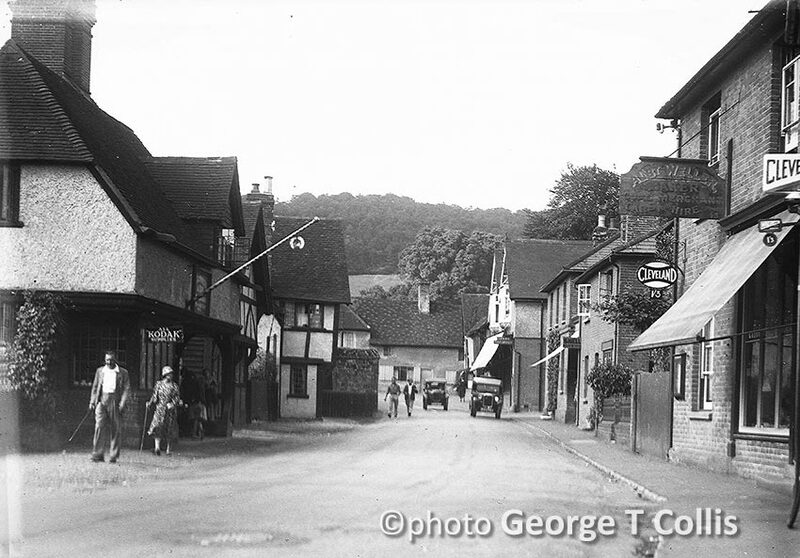 Crash at Gomshall, Surrey - Second World War? "My Uncle was a fireman on the Southern Railway. 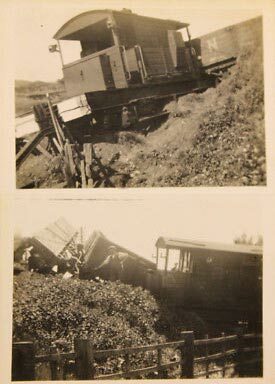 I have a photograph of a smashed up locomotive. 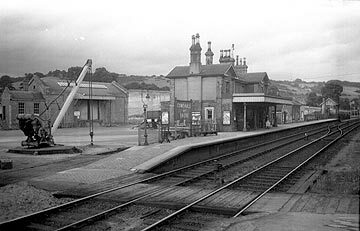 The story that has been past down to me over the years is roughly as follows: My Uncle was on the footplate of a freight train, carrying shells in a southern direction through Gomshall station. 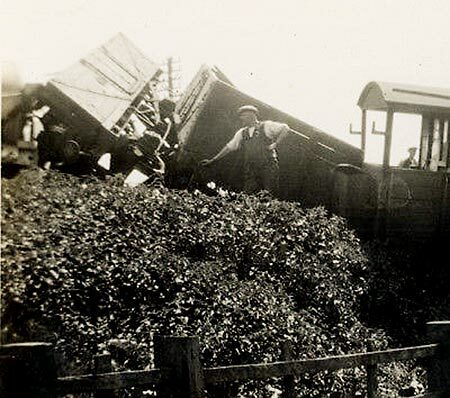 I am led to believe an express passenger train was given priority and my Uncle's train was diverted off the main line and crashed into a siding at Gomshall. 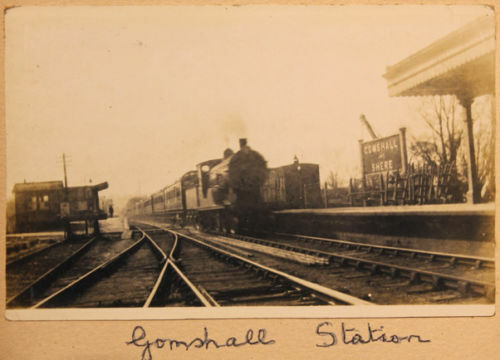 I have trawled the internet and can only find a record of a crash at Gomshall in 1904. This has led to me questioning the story behind the photo I have in my possession. If anyone has any information on the authenticty of this accident I would love to hear from them, and if there is a possible line of investigation I will download a copy of the photo to aid any research" Alan T.
It would be wonderful if we could see the photo that Alan has in his possession - This was posted almost 10 years ago however (2009). If anyone could help out on this, please contact. 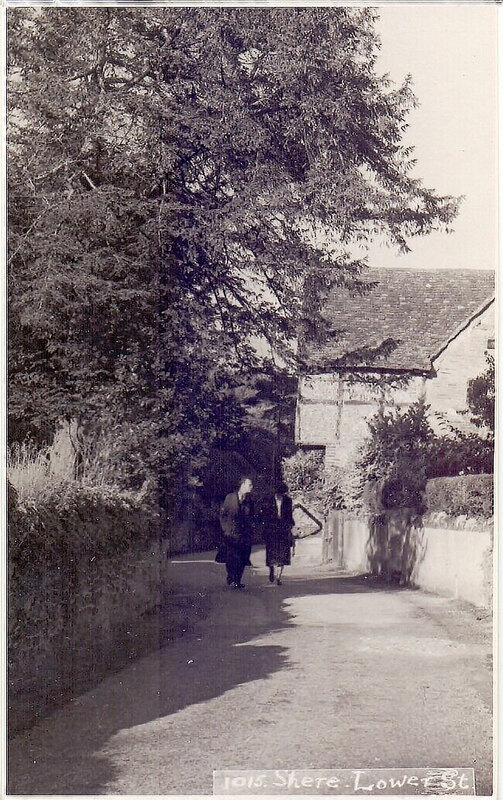 NEWLY UNCOVERED PHOTO: This 97 year old photo of two ladies sitting on the wall with the Lavender Lady Barn in the background. The First World War Carriage Gun sits next to the Tillingbourne. This gun was placed to commerate the finish of World War 1 and was in place between the two World wars (1918 to 1940). In 1940 the gun was taken away and used as Scrap Iron for the Second World war effort. The above photo was taken from the opposite direction 10 years later. 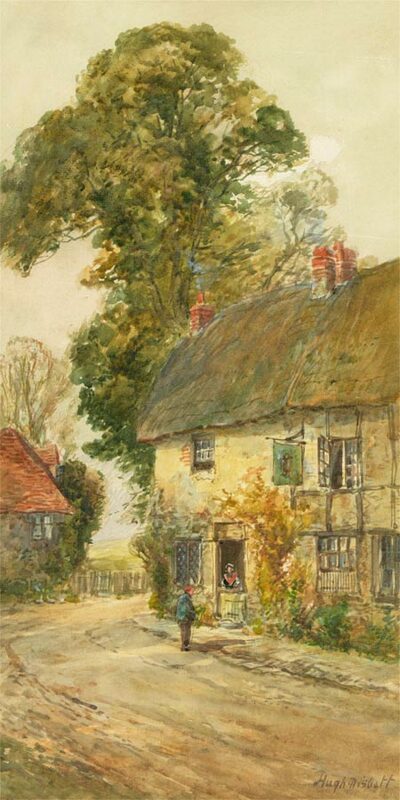 Can anyone identify the cottages in the painting? e-mail me if you do, love to hear from you. "I found the painting at a boot sale. The frame had no glass but carried a signed print by the artist Mary Stork. The print was still in the original cellophane wrapper. The backing of the frame had been pulled away on one edge and the print pushed in, the cellophane acting as glass - it actually looked terrible and very distorted but had apparently been hanging on the wall like this for some years! 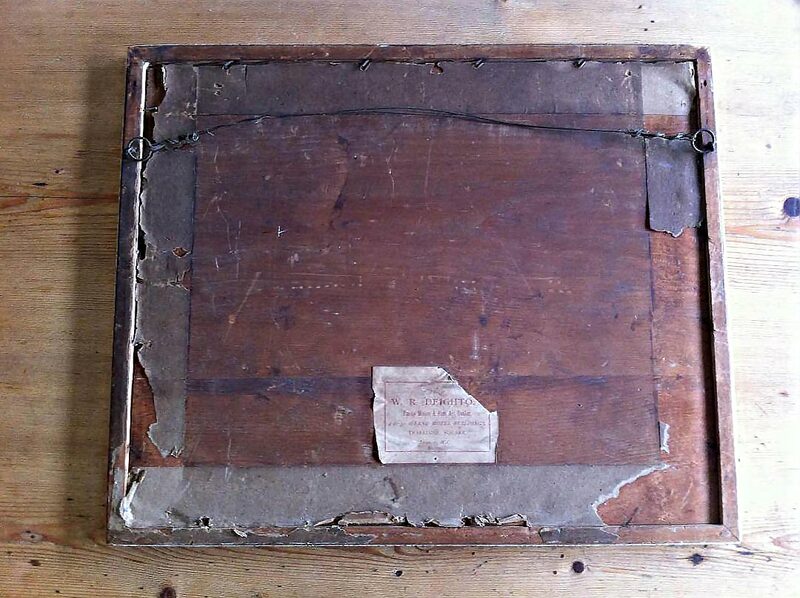 - although I suspect it helped preserve the colours on the little gem underneath." "If I may explain further. 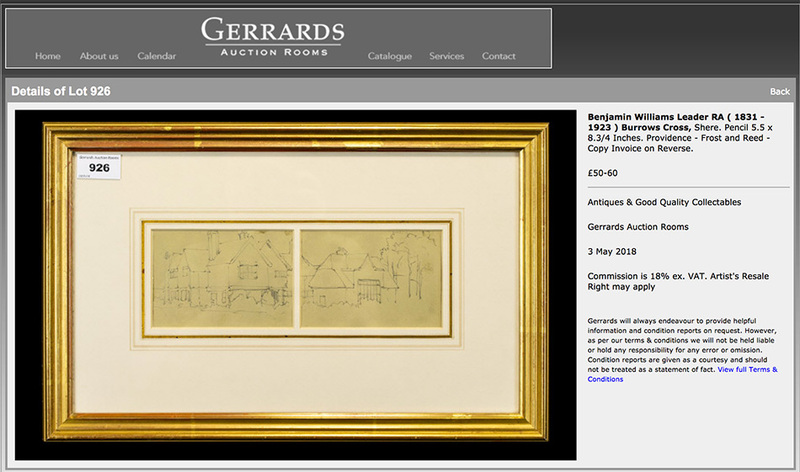 A recent acquisition was a small modernist work which had been fitted into a 19th century frame. 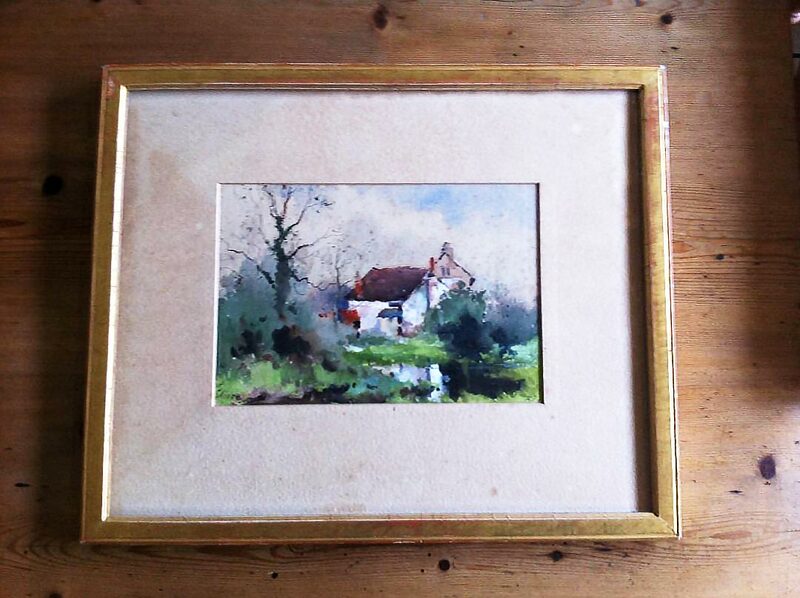 When I opened the frame I uncovered a lovely impressionist watercolour of a cottage hidden beneath. Suffering from foxing it is nevertheless still crisp with strong colours and clearly undertaken by a talented hand. 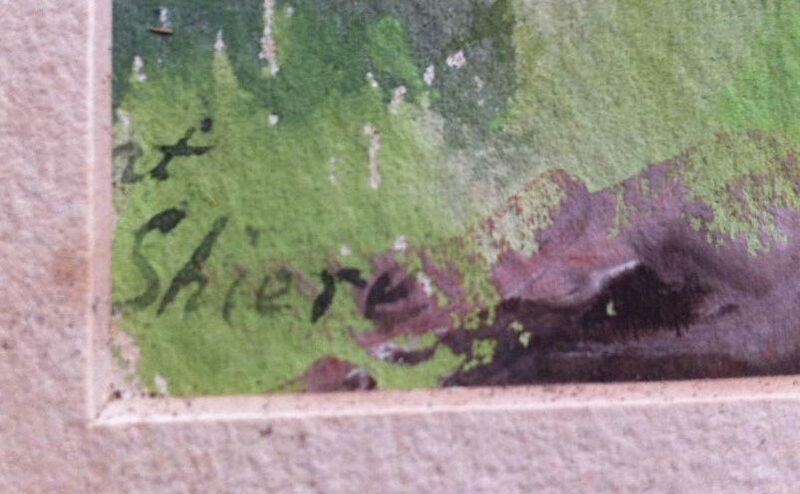 The painting is inscribed 'at Shiere' (bottom left) and initialed RJ and dated 87 (undoubtedly for 1887) bottom right." 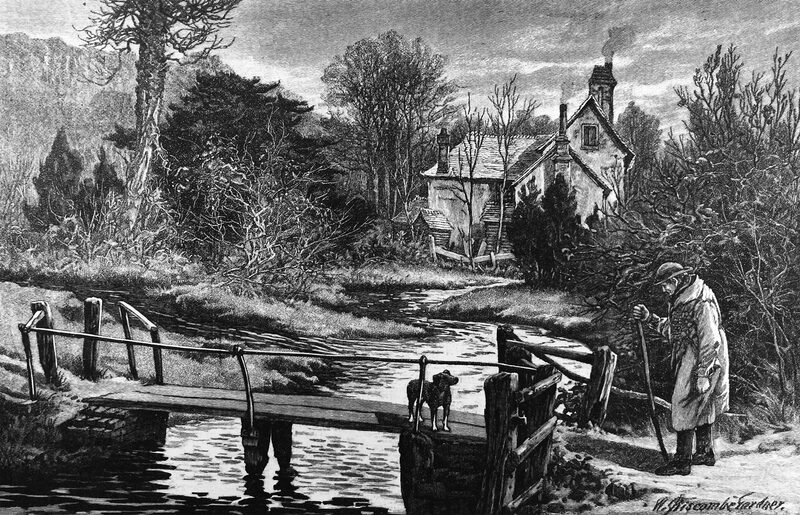 The little gem underneath, I recognise as a painting of High House from the wooden footbridge leading from the Swimming Pool field to St. James' Church. 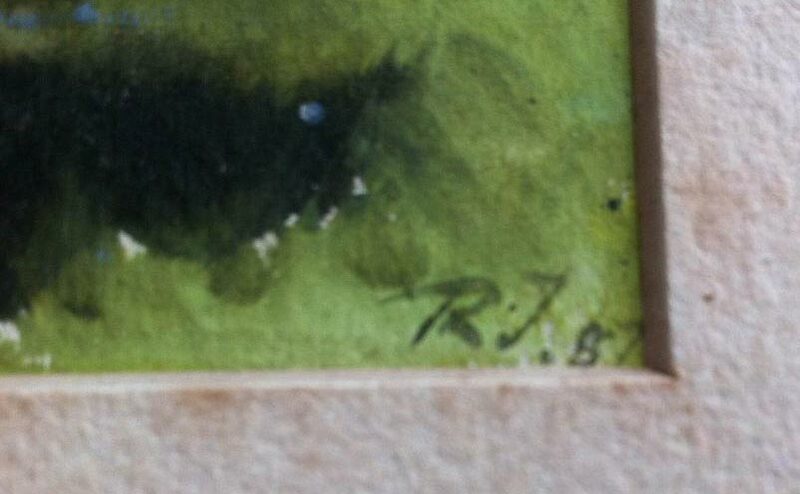 Can anyone help us locate information on the painter 'RJ'? What do the initials 'RJ' stand for? 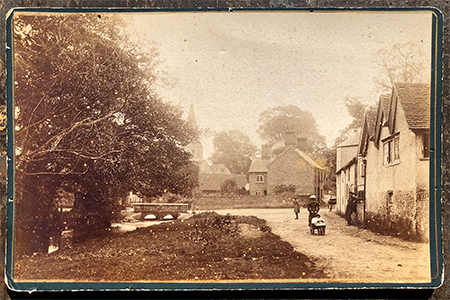 1889 - This rare 129 year old photo has been uncovered by NI Books in East Sussex of Lower Street looking towards The Square and the Tillingbourne Bridge. 1904 - Fair in the Square - The annual Shere May festival. 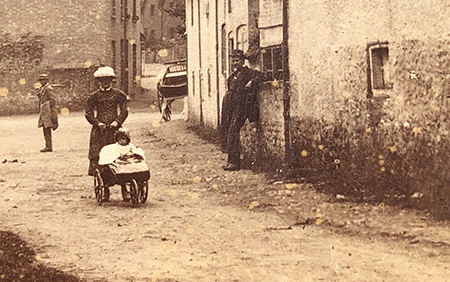 This rare 114 year old postcard gives us a real glimpse back in time. 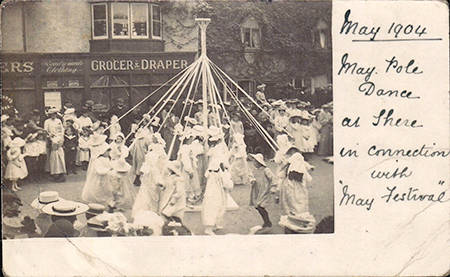 The wonderful fashion of the Edwardian era (1901 – 1910) and a large turnout of villagers watching the Maypole dance. This annual festival was known as 'Fair In The Square'. 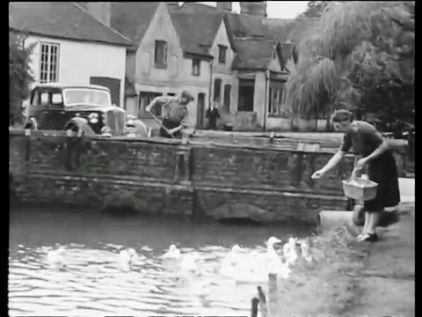 In the background we see 'SANDERS, Grocer & Draper' (now 'Shere Shop') with 'Vaughans' to the right. 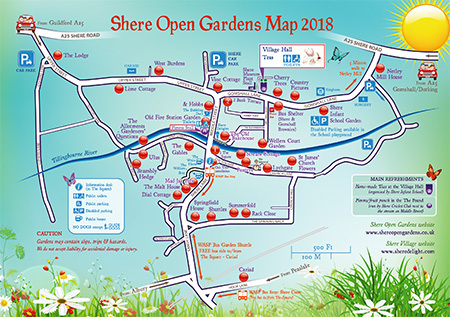 Click on the above postcard image to see more detail - You can read to the right of the shop name, "Ready made clothing"
Shere Parish Council posted the above information entry on on their Facebook page. 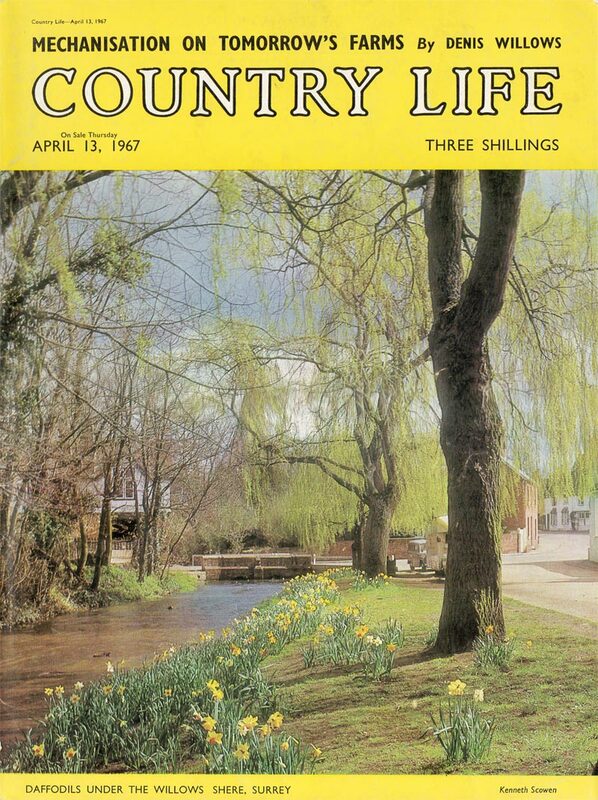 13th April 1967 issue - 14 years on. 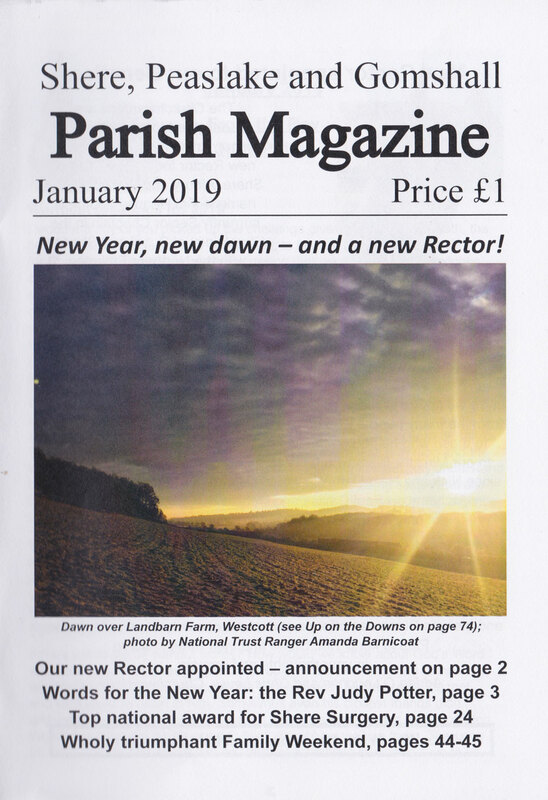 Visit the SPC FB page to keep up to date with any parish news or head over to the Shere Parish Council website. 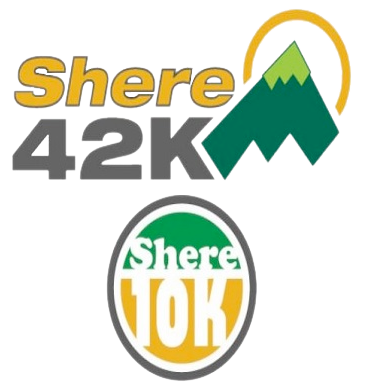 combined with 42k, Half Marthon & 10k Event. 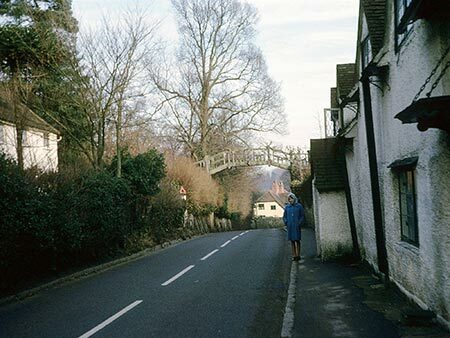 This rare postcard shows a young girl standing at the Tillingbourne bridge at the end of Middle Street. Click the above photo to view more detail. 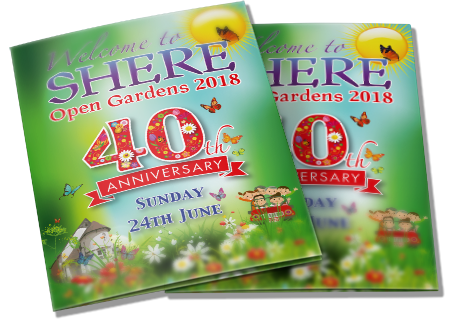 This is a huge celebration for the village of Shere, the 40th Anniversary of the Shere Open Gardens event, organised to raise money for a variety of village charities. Entry: Adults: £7; OAPs/over 65's: £6; Children under 16: FREE. 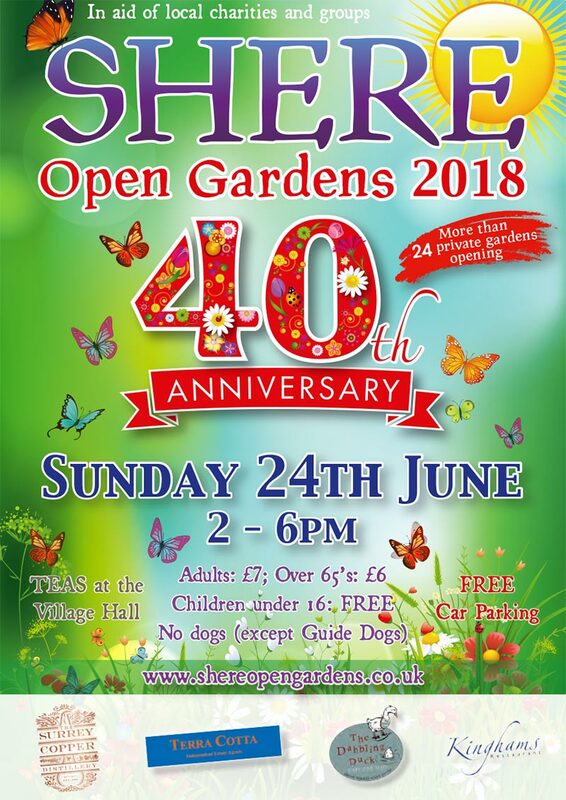 Tickets are available at the village hall and selected gardens, ask parking attendants for the nearest point. 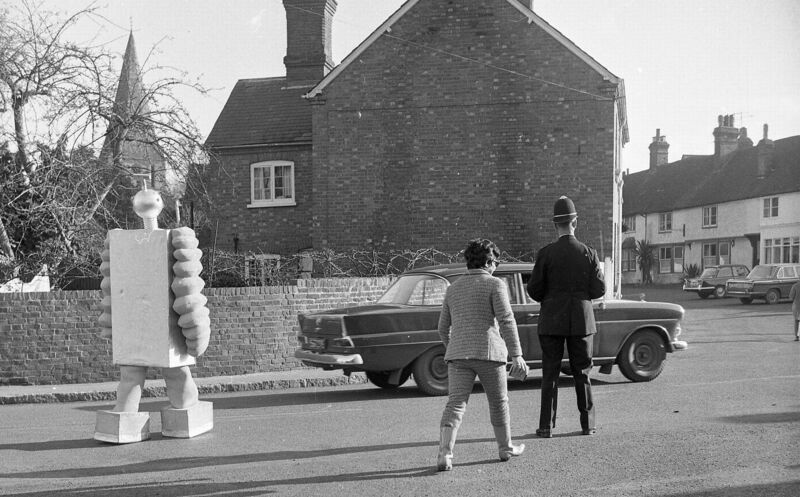 1968 - Do Not Adjust Your Set - Sir David Jason (OBE) as 'CAPTAIN FANTASTIC' in Shere.. with a huge robot - 50 years ago!! Do Not Adjust Your Set was a British TV comedy sketch series produced originally by Thames Television (Rediffusion, London). Transmitted on the ITV channel from 26 December 1967 to 14 May 1969. The series starred members of the yet to be created "Monty Pythons Flying Circus" (two years before): Eric Idle, Terry Jones, Michael Palin. Also starring was Denise Coffey, Sir David Jason OBE and the 'Bonzo Dog Doo-Dah Band'. 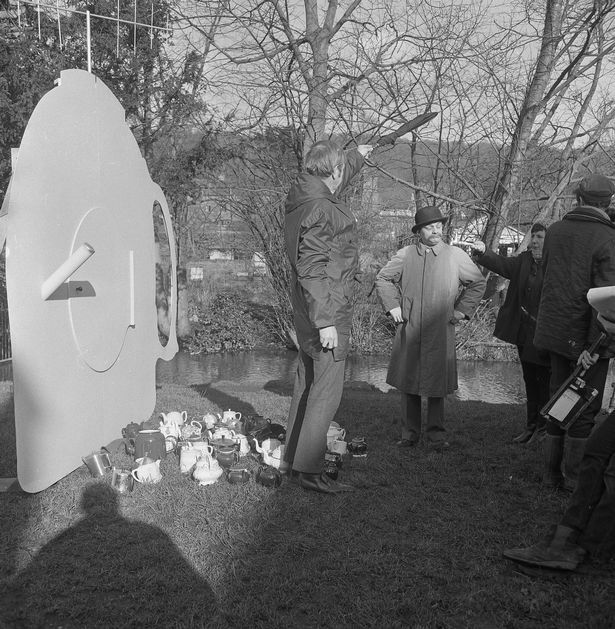 This sketch was fimed in Shere with David Jason playing 'Captain Fantastic', some 50 years ago - The programme's first series was directed Humphrey Barclay (born in Dorking) Humphrey was also known for producing the BBC radio series, I'm Sorry, I'll Read That Again and TV's Desmond's, Two's Company and Look Back in Anger. There has been a lot of paintings, illustrations and sketches going to auction of late and here is another amazing find. 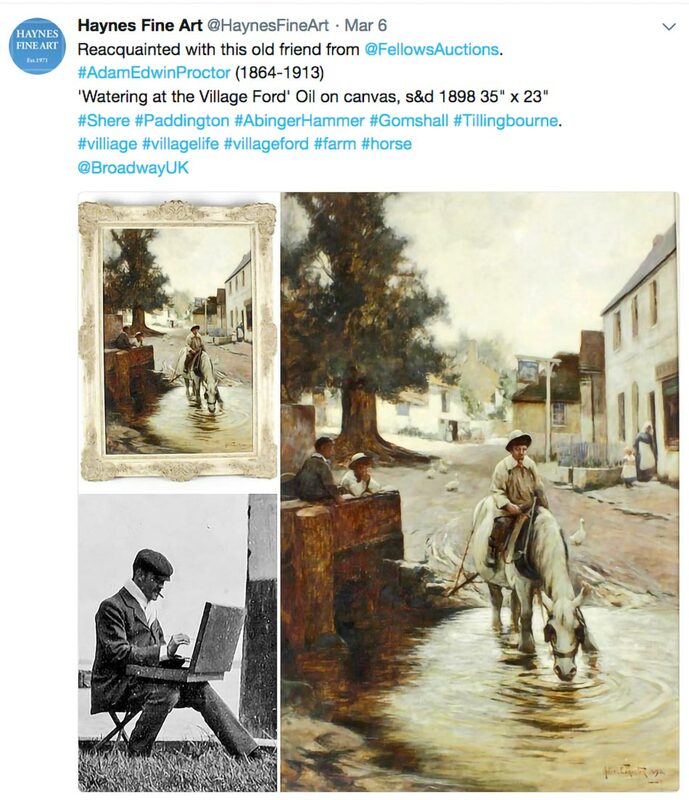 This time by one of England's most outstanding late Victorian landscape and coastal painters. Famous for his paintings of St. James' Church, Benjamin is buried in the churchyard, along with his family. 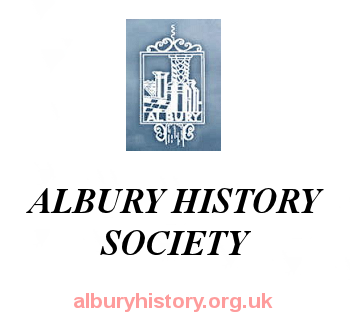 This excellent History Society website, from our neighbouring village, ALBURY. A great source of information. 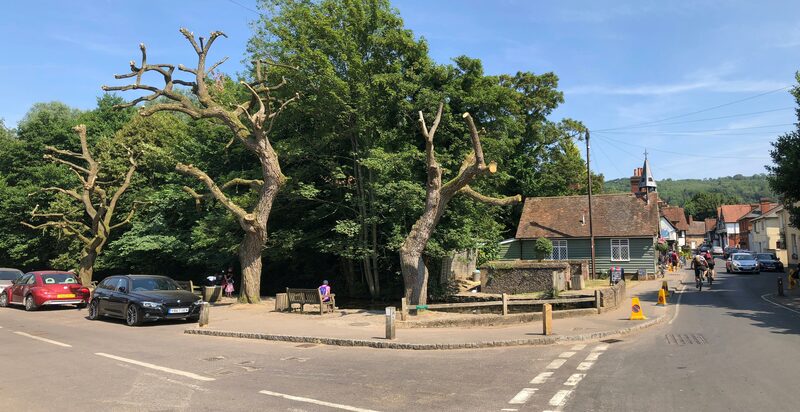 Goal to raise money for a memorial bench in Shere. 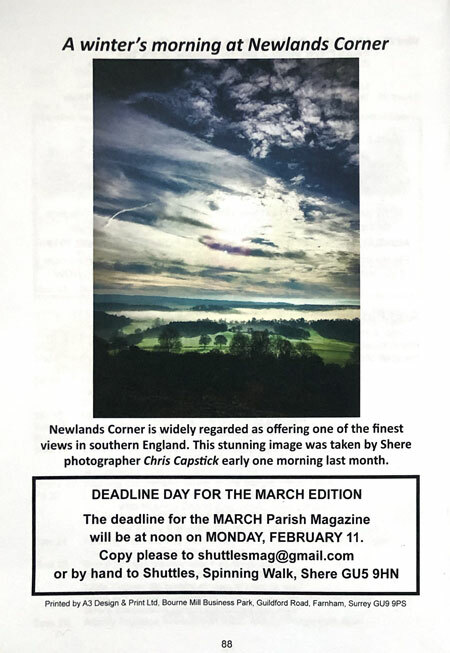 As first reported in this months Shere Parish magazine (Page 31), Sasha Cook is planning to raise enough money to purchase a memorial bench in Shere so we can all remember Ben her late brother, Ben Cook. Sasha has started a business in order to raise £2,000 and is setting up a ‘pop up’ shop in the Pound this weekend. Please try and come along to support the family. This amazing photo of Middle Street was taken sometime between 1920 and 1930. 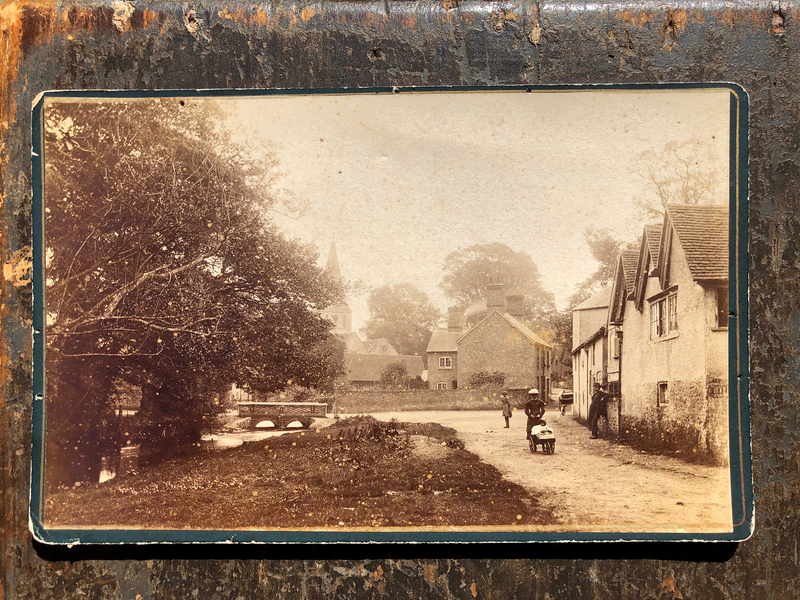 A huge thanks to Bill for allowing us to display and enjoy his Grandfathers photo of our village. photo ©George T. Collis, all rights reserved. Oils, Watercolours and Prints from single owner on sale in March 22nd. 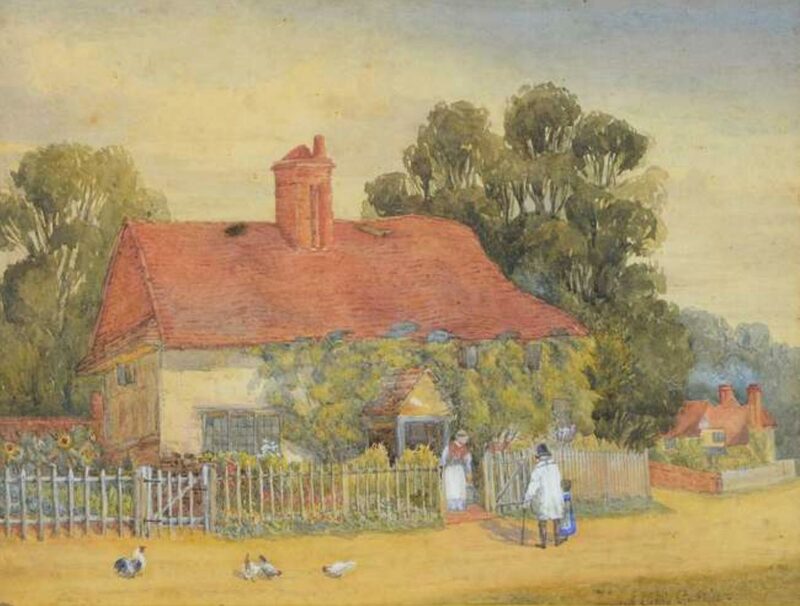 Ewbank’s, Surrey’s leading auction house, has a fascinating collection of almost 50 paintings, mostly depicting Shere and the Surrey Hills, going on sale as part of its Fine Art auction on March 22nd. The auction is on Thursday 22nd March 2018 at 10am and the full catalogue will be online from 9th March 2018. 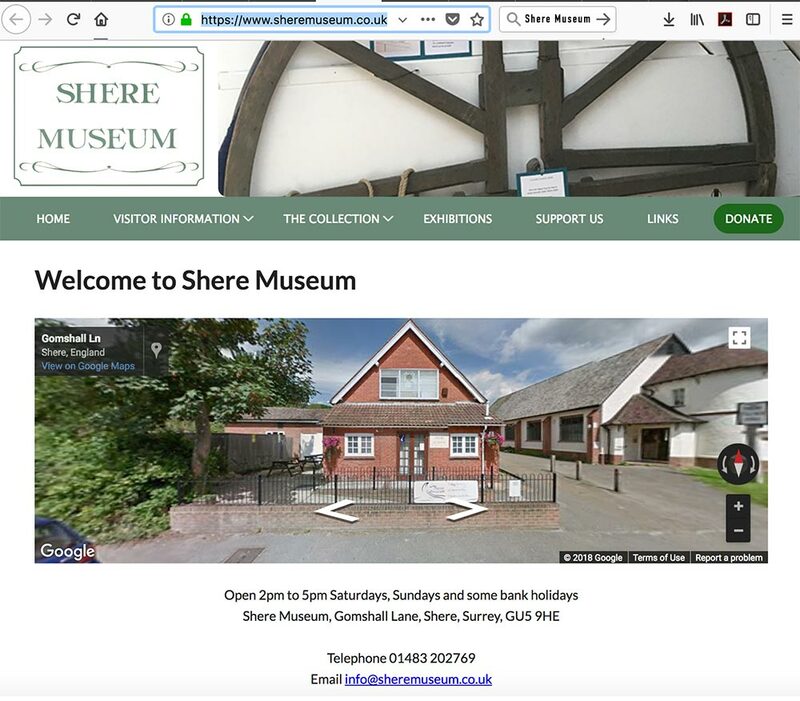 Shere Museum has a new website: https://www.sheremuseum.co.uk. Additional pages and features such as the volunteers' rota and social media interface are currently in development and will be added in the as part of the next phase. 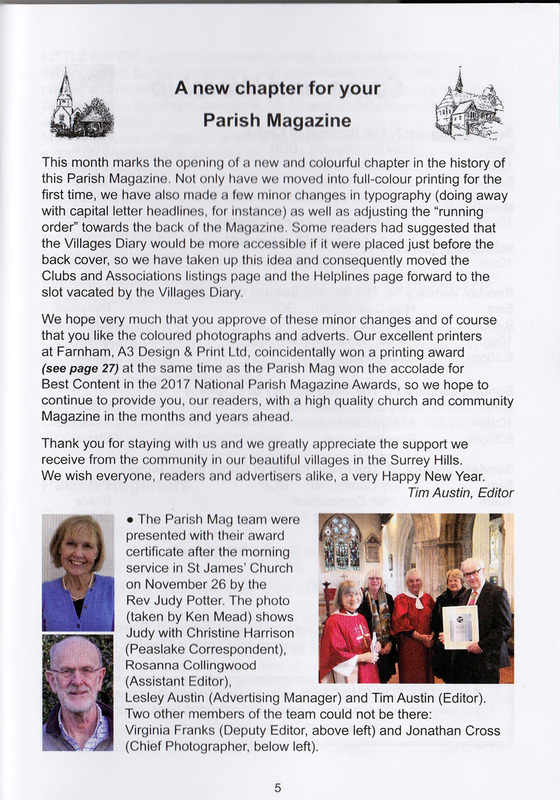 Thanks to Shere resident, Anna Kingston for her devotion and expertise in creating the new website and to the Museum Trustees and Management Committee for their tireless work in making it all happen. 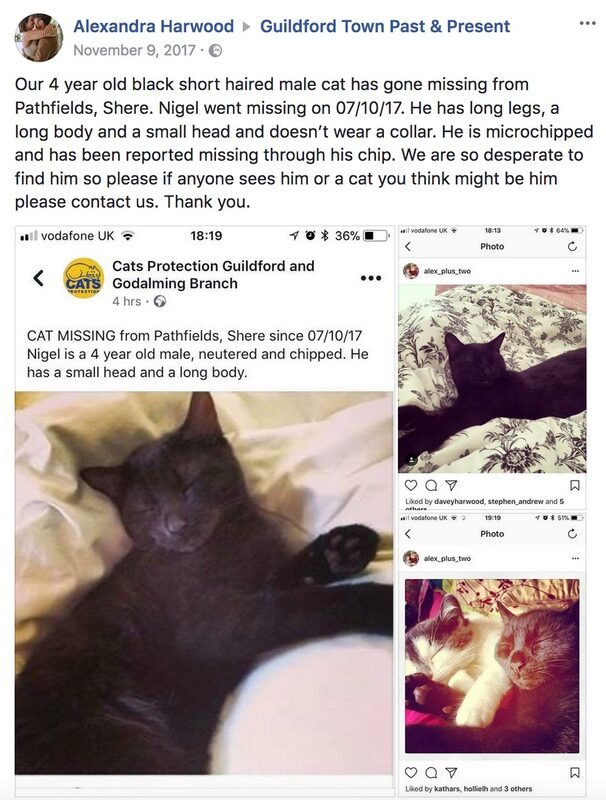 Nigel is still missing from his home in Pathfields, Shere. If anyone knows of his whereabouts or has kindly taken him in, please drop us a note. Please e-mail if you have news - Thank you. 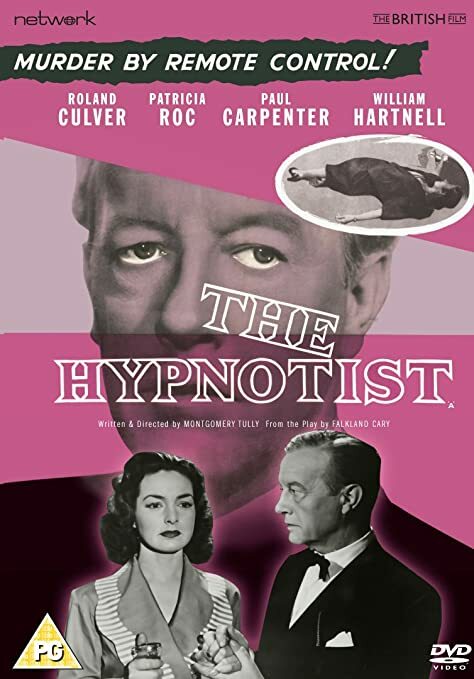 I can reveal that the 1957, The Hypnotist (also known as Scotland Yard Dragnet) has also come to light. Starring the original Doctor Who actor, William Hartnell. 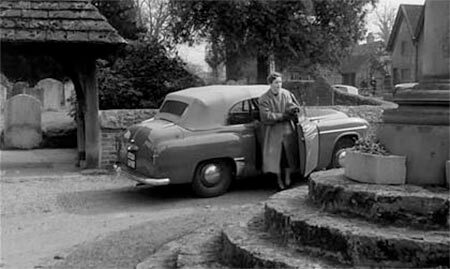 I am staggered at just how many more films get uncovered where our village has been used as a film location. Car drives down Lower Street, turns left into Middle Street, over the Tillingbourne. 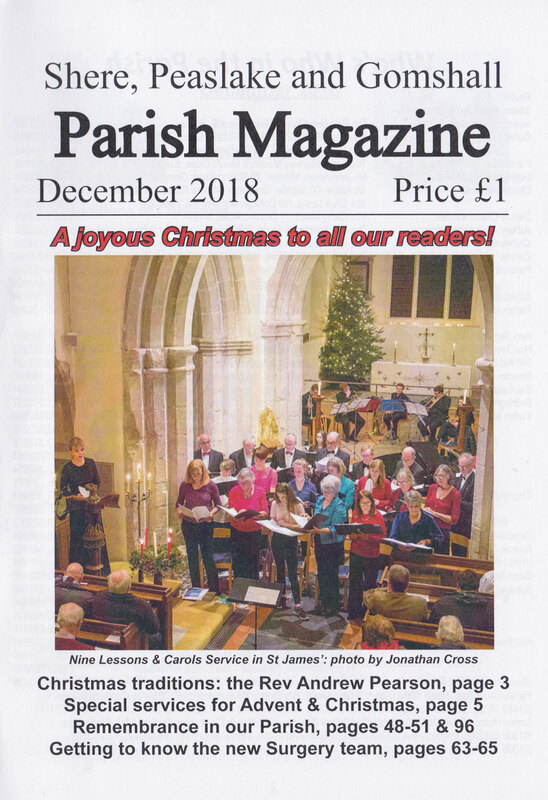 The very first issue of the January 2018 Parish Magazine to be produced and printed in full-colour. 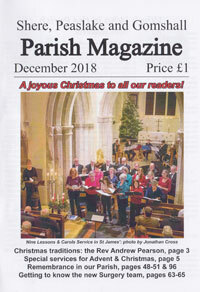 Up until the end of last year, the Parish Magazine's front, rear and four centre pages were printed in colour. 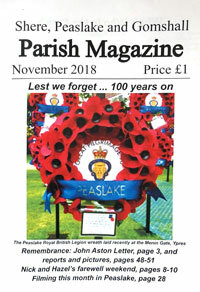 As of January 2018, the magazine will be produced and printed in full-colour throughout. 1972 (Peter O'Toole, Alastair Sim, Arthur Lowe). Shots of 'The White Horse interior and outside shots of 'The Square'. WATCH video clip (Inside the pub and outside in The Square). (DW Griffith 1918 silent film) - some location shots. Starring Erich Von Stroheim, D.W. Griffith, Lillian Gish, Noël Coward, Dorothy Gish, Robert Anderson, Robert Harron, Billy Bitzer, William "Wild Bill" Elliott and features David Lloyd George. (David Niven and Kim Hunter) but seen very briefly through camera obscura that if you blink you would miss it. 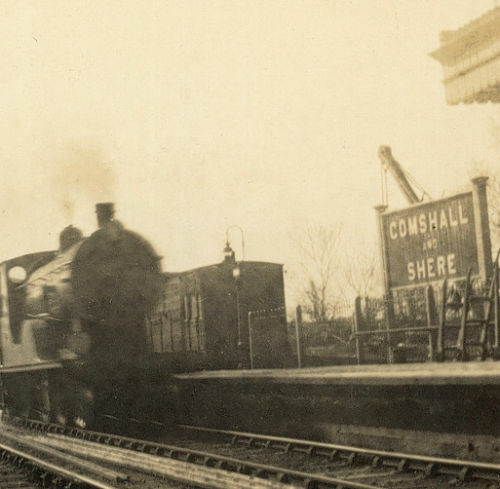 Gomshall station was previously known as Gomshall & Shere, as it also serves the adjacent village of Shere. It has been an unmanned station since 1967. 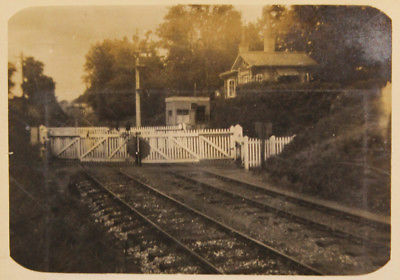 Shere to the station by bus/foot. 2013/14: 59,226. 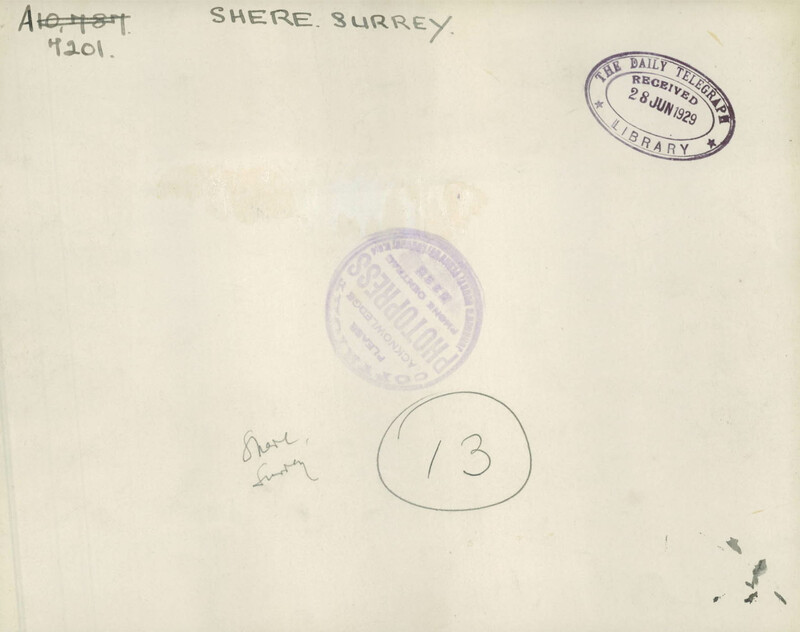 (Clandon 202,062) - Gomshall: Numbers stabalised. 2014/15: 58,430. (Clandon 216,602) - Gomshall: Numbers down. 2015/16: 56,806. (Clandon 222,396) - Gomshall: Numbers dropping. 2016/17: 58,228. (Clandon 222,750) - Gomshall: Numbers increased. Contact - Love to hear from you. Paintings - Local and international artists. Photos - Past and present photos. 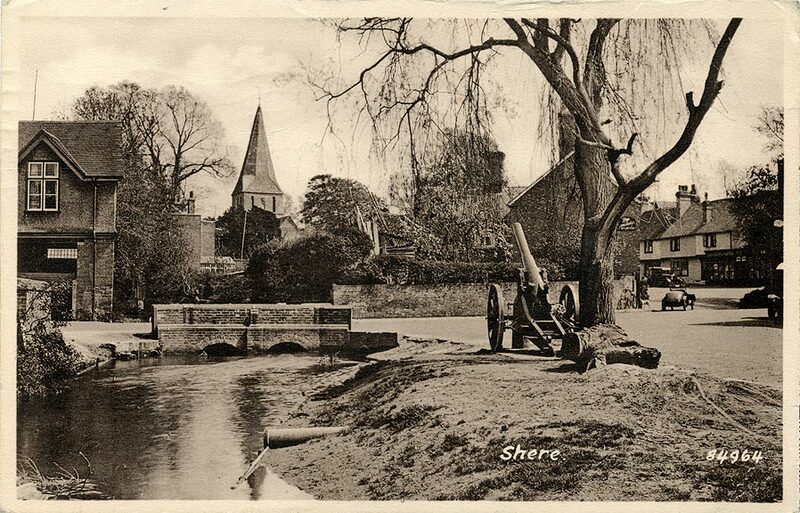 Postcards - Shere through the ages. PS - Messages from the past. 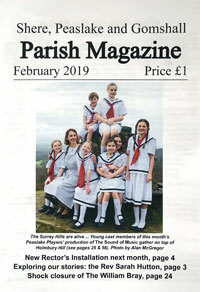 'Fire Brigade turn-out in the Country' is now available to view on this Shere Village website. It is the first time that this film has been available to view publicly. .. a much sought after as a residential location, being within commuting distance of London and accessible to the M25 motorway. At weekends visitors come to visit and enjoy the scenery and facilities offered by this attractive village. 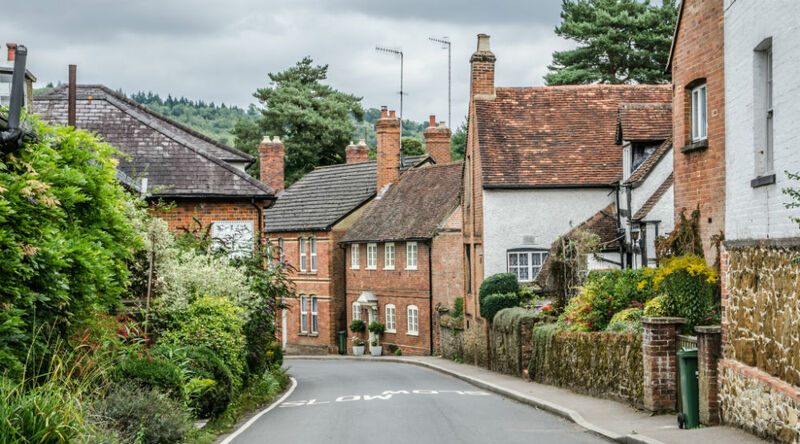 Set in the Tillingbourne Valley, Shere has everything a village should contain. 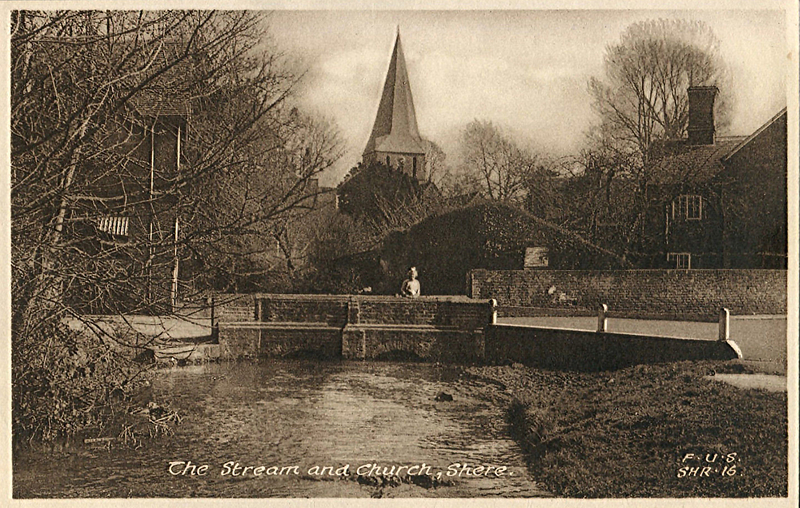 There is a ford, ducks to feed, two pubs, shops, a teashop, blacksmith and an ancient church. 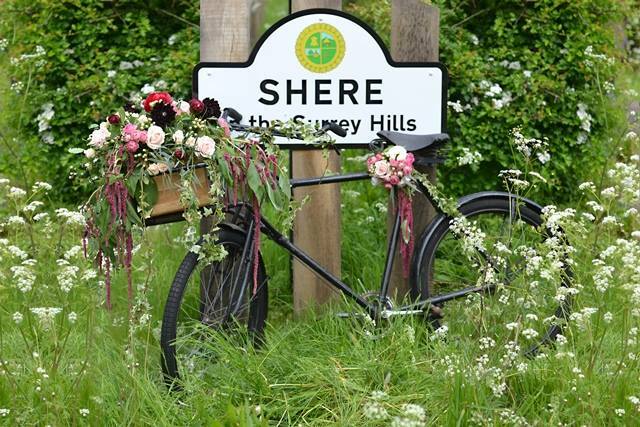 It is no wonder that Shere has been chosen as a location for a number of film productions. 'Bridget Jones: The Edge of Reason', starring Renee Zellweger and the 2006 film, 'The Holiday', starring Kate Winslet, Jude Law, Cameron Diaz and Jack Black, both feature Shere. 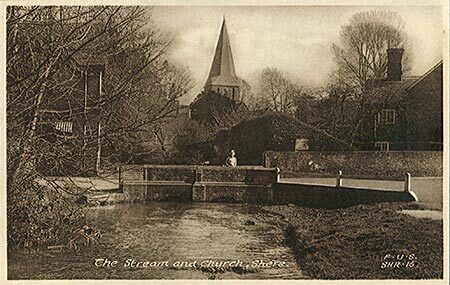 Shere is mentioned in the Domesday Book in 1087, as 'Essira' and notes the church, which probably existed long before the Norman invasion. 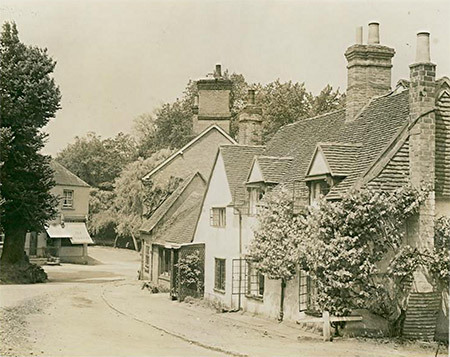 The cottages in Shere present a mixture of styles from the 15th to 20th centuries, but the central part of the village is still fundamentally 16th and 17th century, with many timber-framed houses. The names of the cottages in Lower Street, indicate the growth of population and increased prosperity during this period, produced by the woollen industry. Lower Street runs alongside the River Tillingbourne to the Ford. 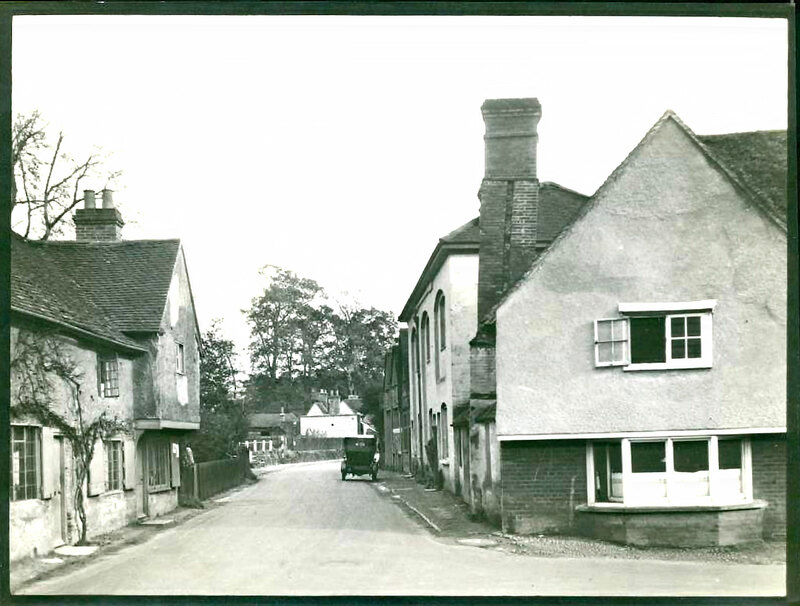 Here you can see The Old Forge, The Old Prison, Weavers House and Wheelright Cottage. 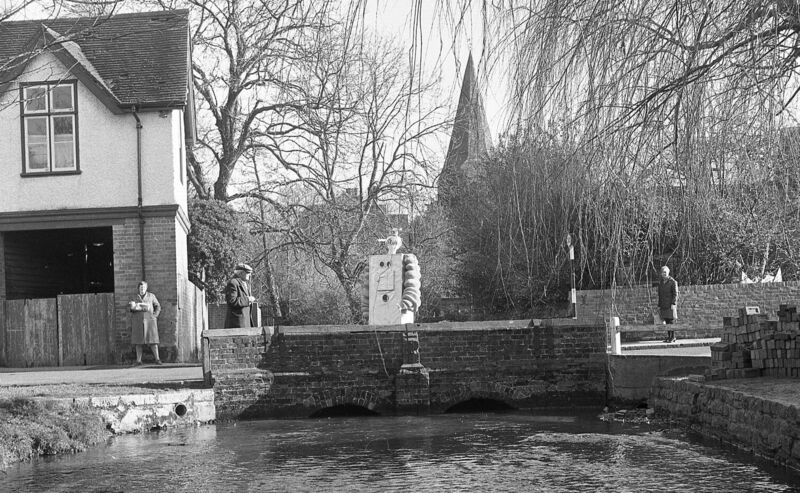 Middle Street contains a working forge and village shops and leads to the bridge across the River Tillingbourne, where the wooden Old Fire Station, dated 1885, can be seen. 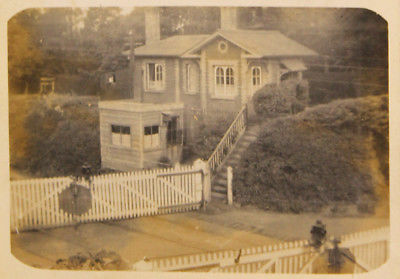 This was the Shere and Albury Volunteer Fire Brigade Station. In 1977, it was converted to public toilets. The White Horse Inn, opposite Church Square, is an attractive black and white timbered building, which in 1450, was a house called, "Cripps". About 1600, a chimney with stone back-to-back fireplaces, was added. It became an inn in the late 17th century. 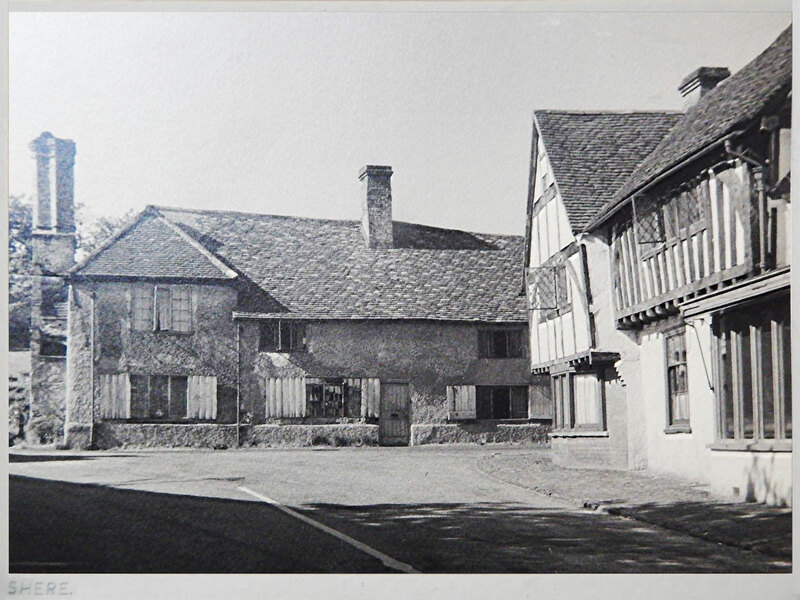 From 1866 – 1945, it was managed by the Askew family and the inn became frequented by literary and artistic figures. The other pub, The William Bray, was once known as the Prince of Wales and formerly Cook's Beer House. It was built in the late 18th century, the frontage being an early 20th century addition. The Church of St. James has been a place of worship since 1190. The spire, built between 1213 and 1300, is an excellent example of a brooch spire. It was covered with cedar shingles, but in 2000, these had to be replaced and handmade oak shakes were used. There are several brass plaques in the chancel dating from 1412, excellent for those who seek to take brass rubbings. An intriguing aspect of St. James' Church, is The Anchoress of Shere. Christine Carpenter, in 1329 made a solemn promise to devote her life to God and live in a holy place. On 14th August 1329, the Bishop of Winchester gave permission for her to be enclosed in a cell which was built in the North wall of the chancel. Food and drink was given to her through a grating on the outside wall. On the inside of the church can be seen the Quatrefoil through which she received the bread and wine of communion. Through the squint window, she could see the altar. Not surprisingly, after three years, she decided to leave her cell, but for reasons unknown, it is recorded that on 10th November 1332, the Bishop of Winchester agreed to her request to be returned to the cell so "she may be enabled to achieve her salvation". William Carpenter, her father, it is believed, lived where the Willow and Ash Cottages now stand in Lower Street. These were built about 1475. The Lych Gate was designed in 1902 by the architect, Edwin Lutyens, who later became Sir Edwin Lutyens and designed the Cenotaph in Whitehall, London. He designed various buildings in Shere for the Bray family, who have been Lords of the Manor of Shere since 1487. 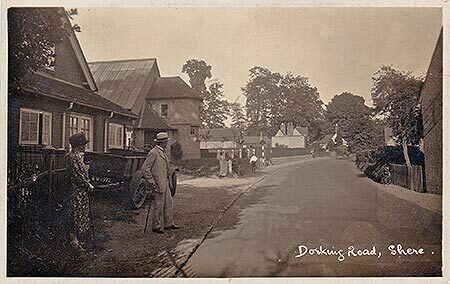 These include The Manor House Lodge and Western Cottages in Upper Street and the building in Middle Street, now used as the Tea Room, "The Dabbling Duck", which was formely known as "The Lucky Duck", and before then "Asters Tea Shop". 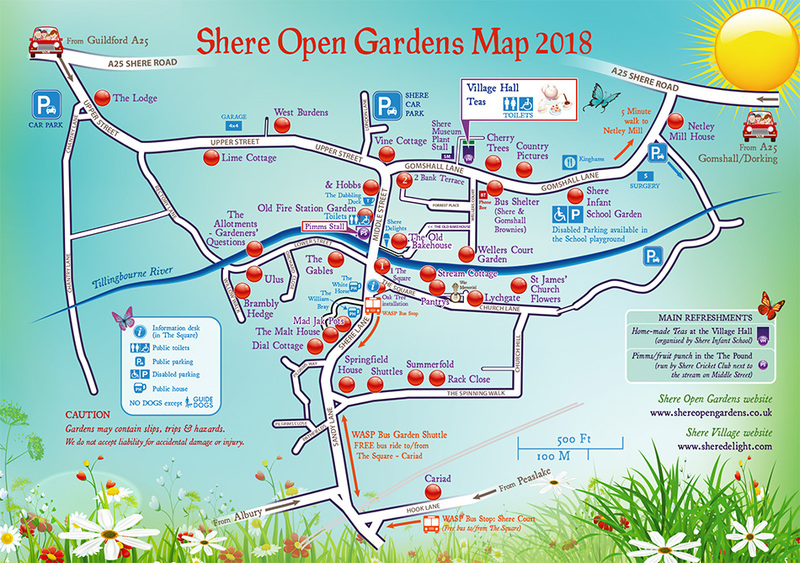 Next year, visitors to Shere will be able to view what is predicted to be one of the most exciting events of the 2012 Olympic Games. On 28th July 2012, the first day of the Games, the Olympic 2012 Mens' Cycling Road Race will start from The Mall in Central London. 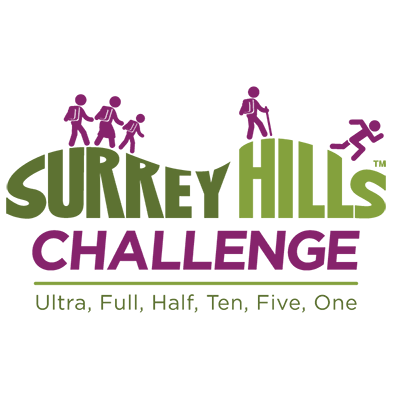 The competitors will race for 240 kilometres through Surrey and return to The Mall in London. 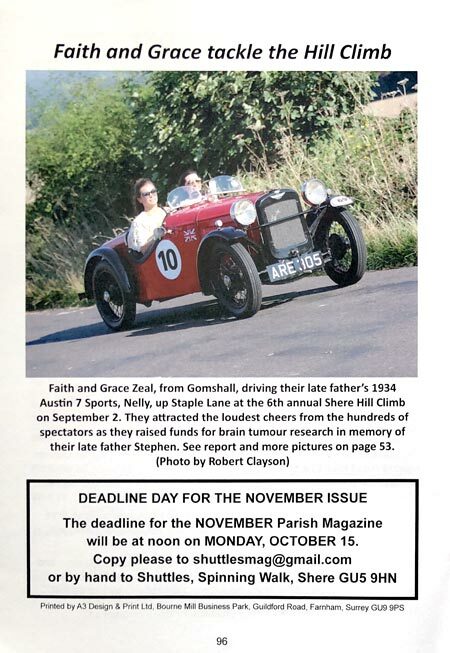 The route takes in Shere, Gomshall and 9 laps of Box Hill. The following day, the Womens' Olympic Cycling Road Race follows the same, but a shorter route of 140 kilometres, again including Shere, Gomshall and Box Hill. 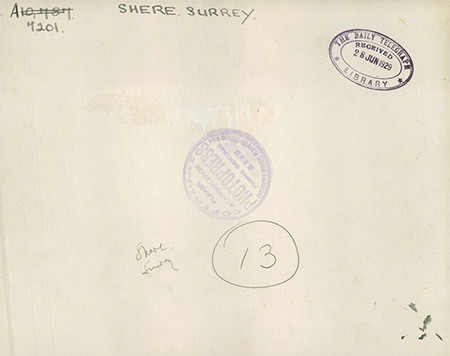 SHERE, Sheire, or Shire, a village and a parish in Guildford district, Surrey. 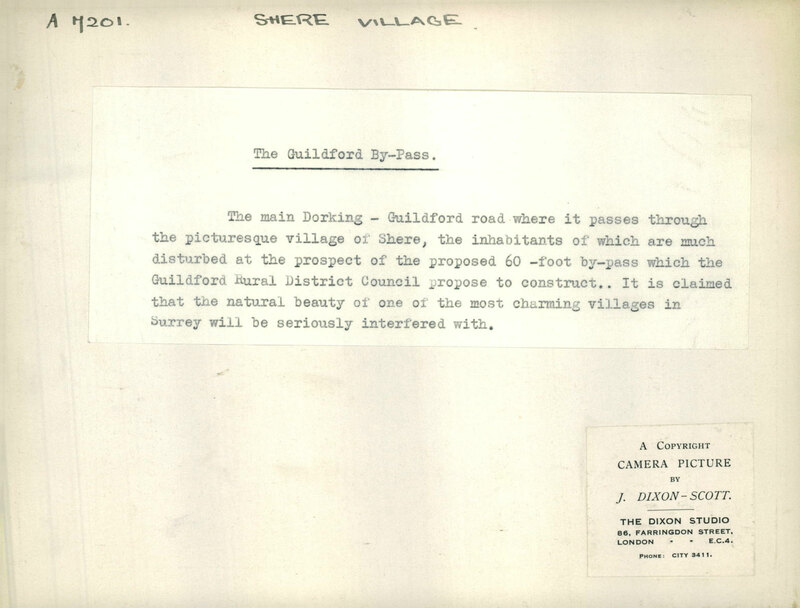 The village stands on the river Tillingbourn, at the foot of a range of chalk hills, ¾ of a mile NW of Gomshalland Shere r. station, and 5½ ESE of Guildford; and has a post-office under Guildford. The parish contains also the villages of Gomshall, and Peaslake; and comprises 6,396 acres. Real property, £6,334. Pop. in 1851, 1,403; in 1861, 1,503. Houses, 302. The manor belonged to the house of York; was held by the Butlers and the Touchets; was given by Henry VII to Sir R. Bray; and belongs now to Reginald Bray, Esq. Fir Hill, Hazel Hall, and Breakhurst House are chief residences; and several large houses were recently erected on the heath. An ancient camp of 8 acres is at Holmbury. 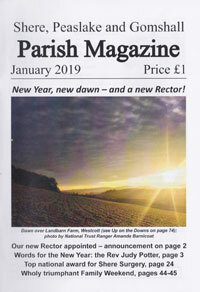 The living is a rectory in the diocese of Winchester. Value, £730. * Patron, the Rev. R. L. Adams. The church is chiefly decorated English; and has a S Norman door, and a central tower and spire There are an Independent chapel, an endowed school with £20 a year, and charities £16. W. Bray, the county historian, was a native. The Hon Sir Reginald More Bray (1842-1923), High Court judge and lord of the manor, lived at the Manor House. 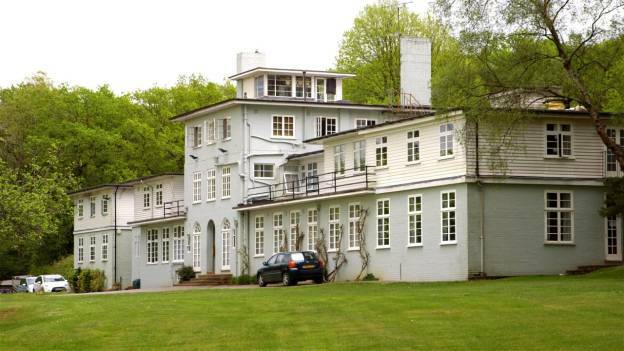 Percy Alport Molteno (1861-1937), the South African shipping magnate and radical Liberal MP, who courted controversy for his opposition to the Boer War and support for black rights in South Africa, lived at Parklands. Other landowners included Robert Scarlett Fraser-Mackenzie, the Hon Henry Cubitt of Denbies (Lord Lieutenant of Surrey), the Duke of Northumberland, the Earl of Lovelace and Rear Admiral R C Sparkes CMG of Shamley Green. 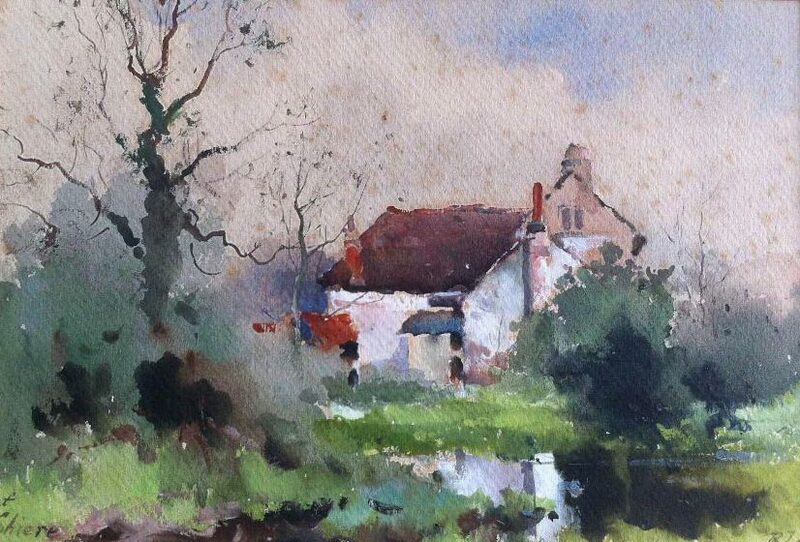 The landscape artist, Benjamin Williams Leader RA (1831-1923) lived at Burrows Cross, Shere. His son Benjamin Eastlake Leader (1877-1916), also an artist, was killed in action during World War I. 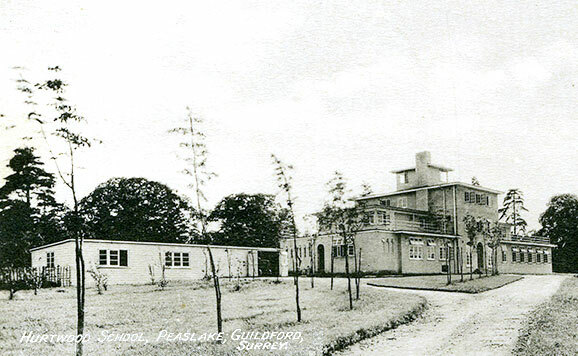 In Gomshall the leading residents were Sir Herbert Barnard JP, at Burrows Lea, and Mrs Levin, at Netley Park.